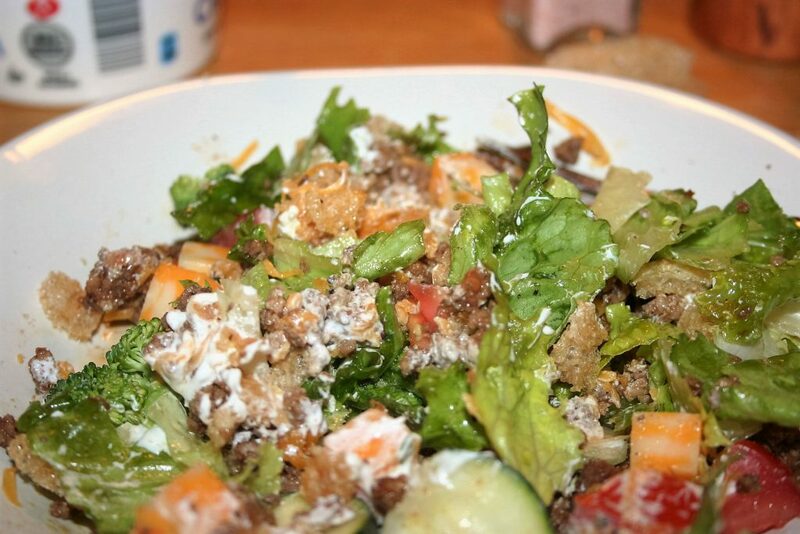 Versatile hearty salad made with meat, cheese, lettuce and whatever else you like. It is the middle of March and ridiculously hot already here in Oklahoma. Okay, maybe it isn’t quite that hot but our air conditioner is in need of help, a.k.a. it isn’t cooling. 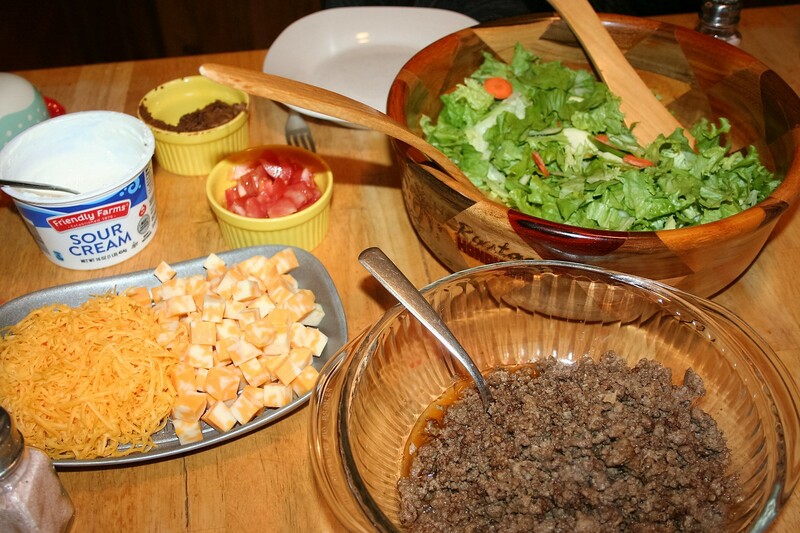 At any rate, it is too hot to make something in the oven for dinner tonight, so I’m changing up my menu and having Taco Salad instead. It’s good to be flexible. 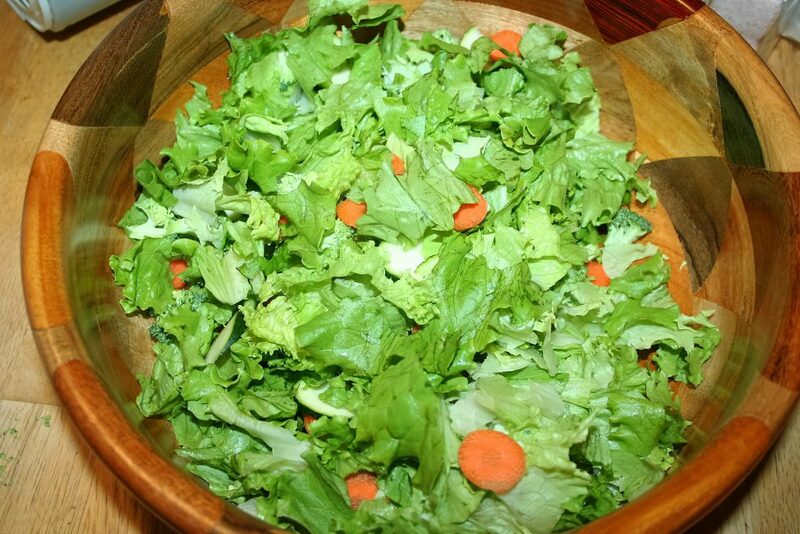 This salad can be fixed in a variety of ways to meet your dietary needs. I’ll be making it TWO ways today! Yep, two ways. 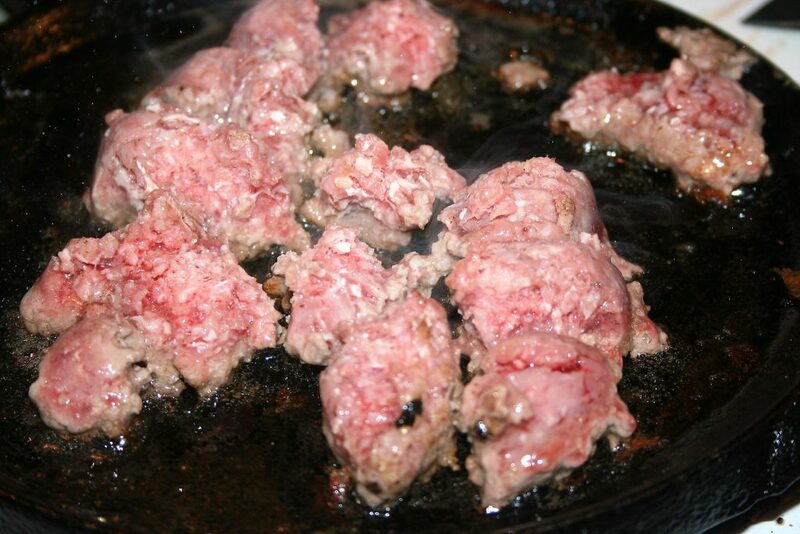 Since Sean, Tiffany, and I are doing keto we need high fat, so I’ll be using 73% ground beef. 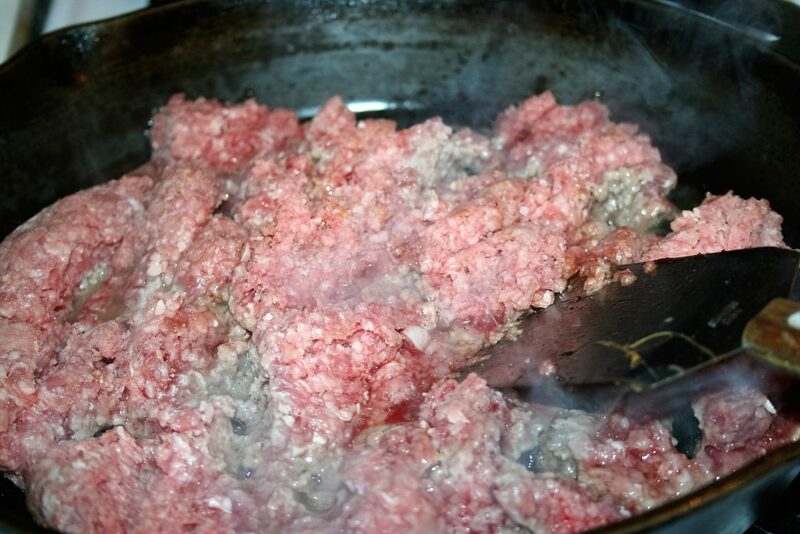 Currently Michael cannot eat beef or he breaks out in a rash and has difficulty breathing, so I’ll fix his with ground turkey. The only other difference will be in what ‘chips’ we use. 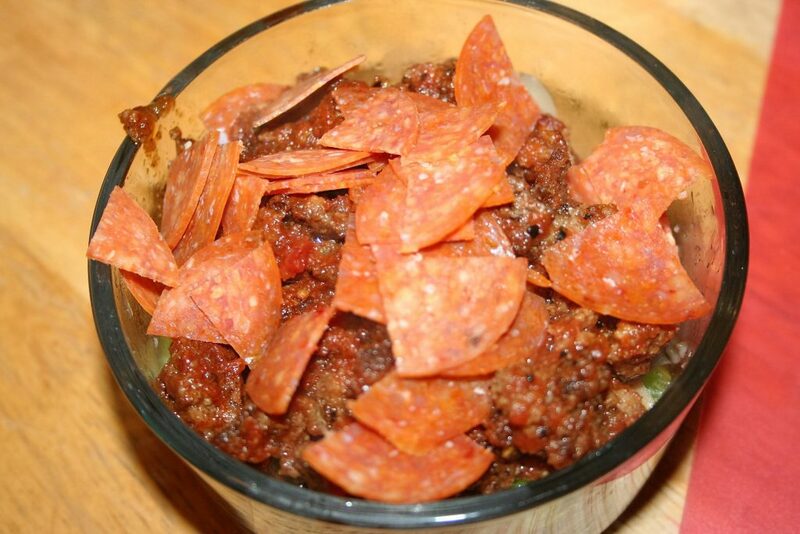 Michael will use plain tortilla chips and the rest of us will use pork rinds. 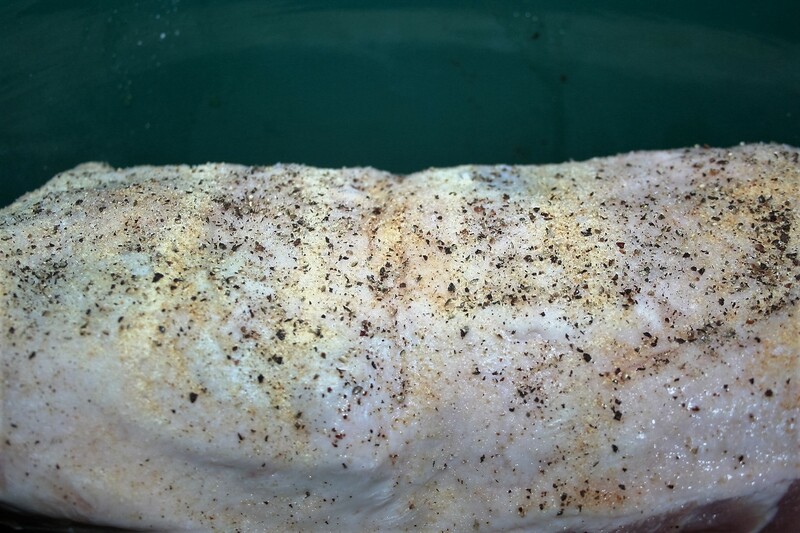 When it is about half done, I like to season it with salt and pepper. 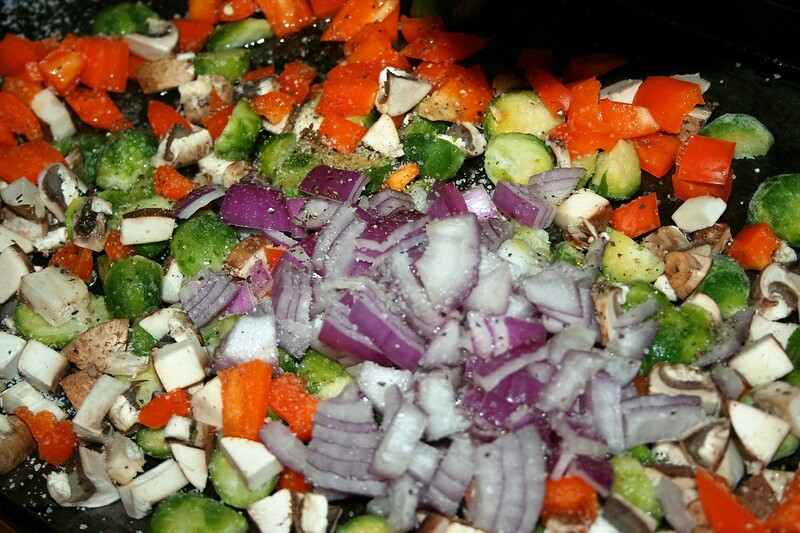 Now add remaining seasonings. This depends on your tastes. You can simply add a package of taco seasoning or a mix of seasonings like I do. 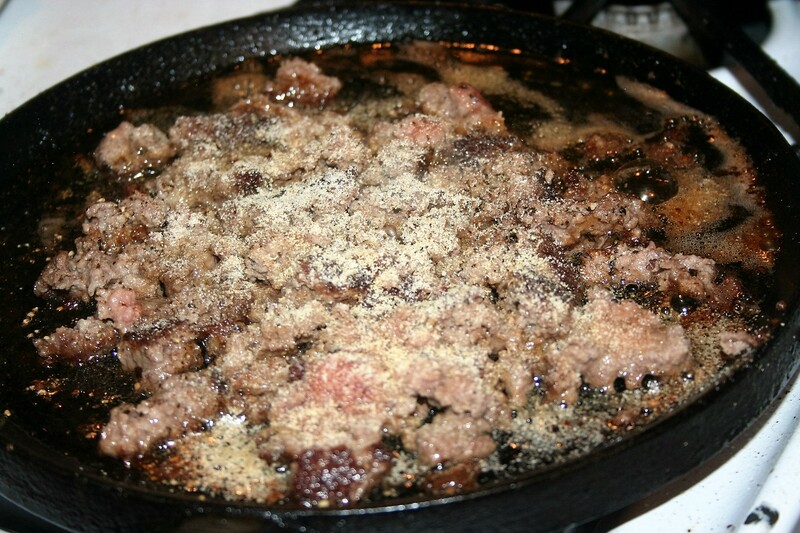 Tiffany doesn’t like purchased taco seasoning, so I’ll use some onion powder, garlic powder, paprika, cumin, and chili powder. Prepare your lettuce. Wash it if it is dirty. 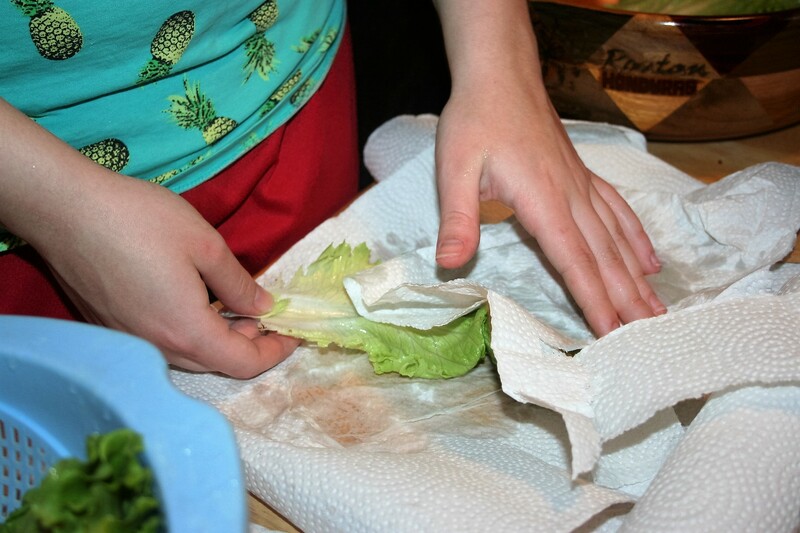 We like green leaf lettuce; it has nutrition unlike iceberg. I put each ingredient in a separate bowl so that each individual can put on the toppings of their choosing. Since this meal was not on my menu when I shopped last week, I don’t have an avocado; thus, we’ll use some sour cream (which I don’t need if we have avocado). 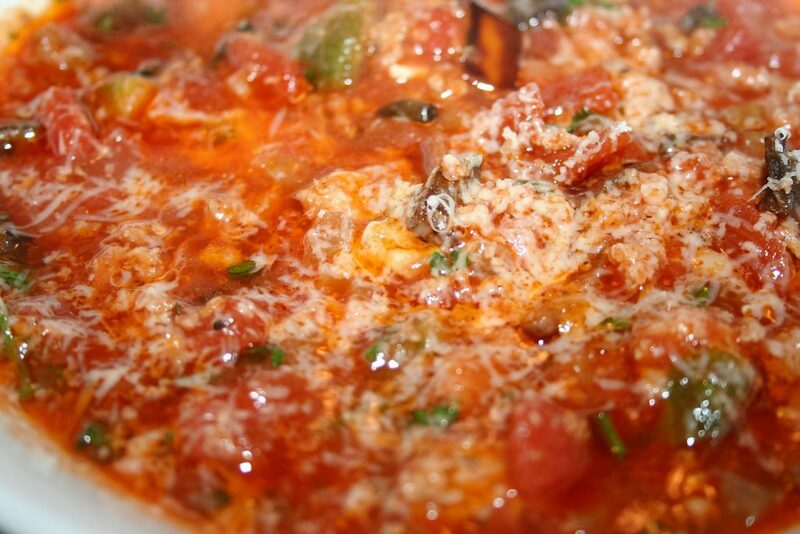 We have tomato, refried beans (for Michael), sour cream, and CHEESE tonight. Tiffany put a little carrot, green pepper, broccoli, and zucchini in the salad. Seriously, a little of each, like a tablespoon or two. Most times it is just plain lettuce. 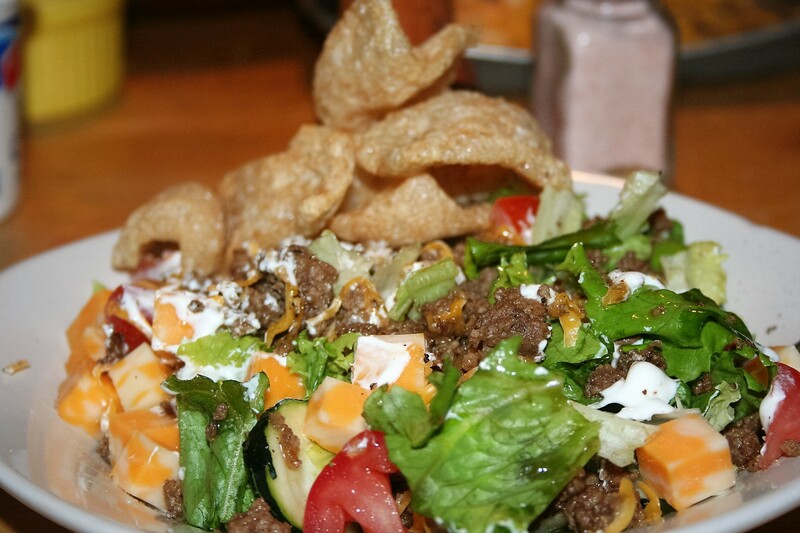 At dinner, everyone will build their salad to their liking. This is mine. Mmmm, mmmm! Serve with nacho tortilla chips, plain tortilla chips, or to keep it keto use pork rinds. I crushed up a few in my salad. 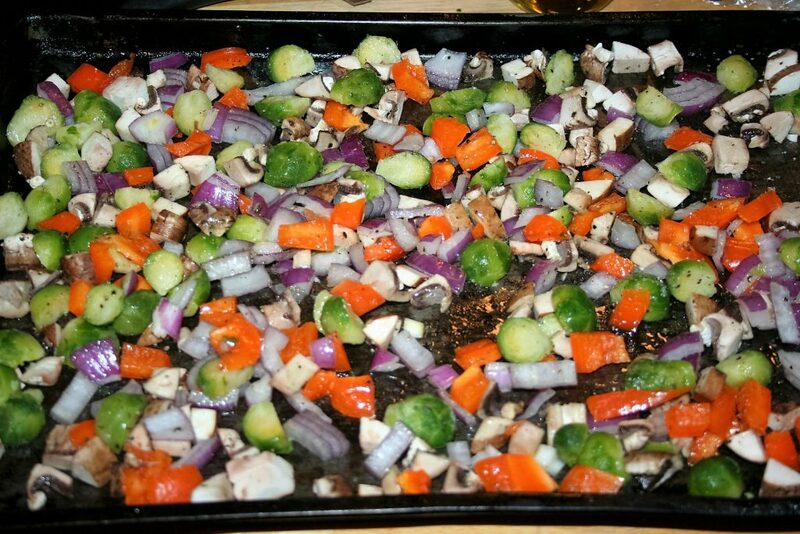 various veggies on hand, like tomato, onion, green pepper, zucchini, broccoli, carrot, avocado, etc. 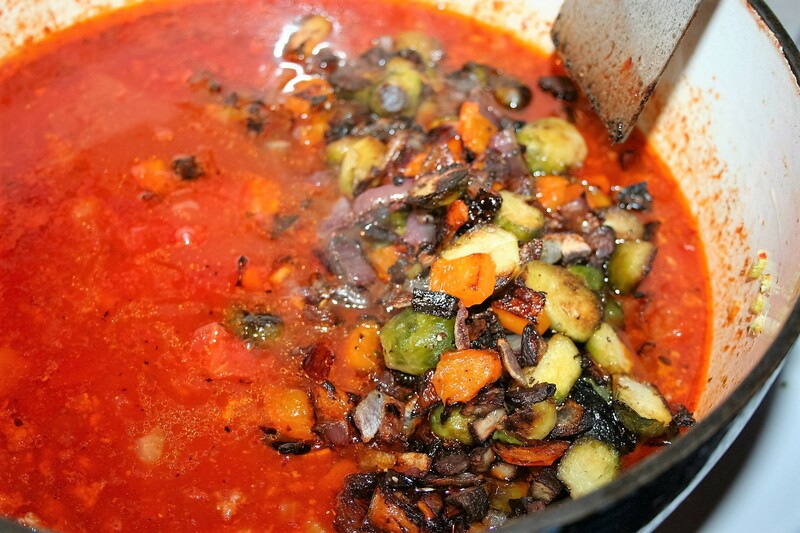 Season with the listed seasonings. 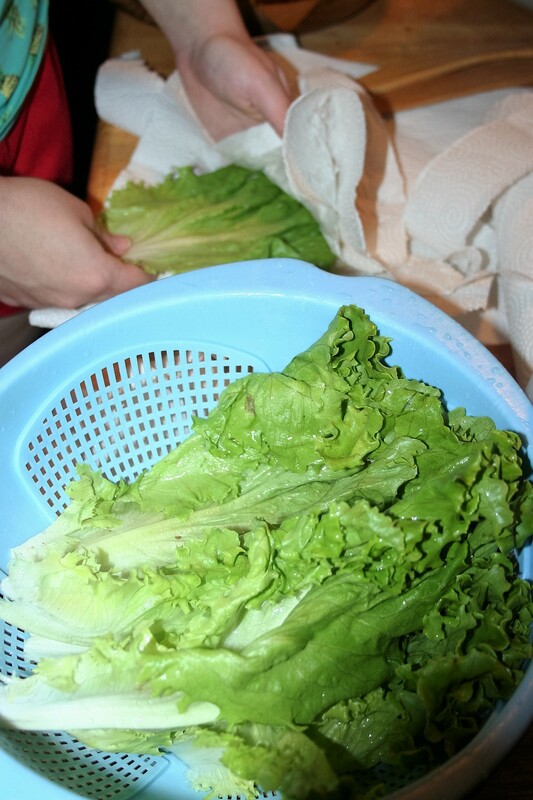 Tear washed lettuce leaves into bowl and add in variety of veggies or none at all. 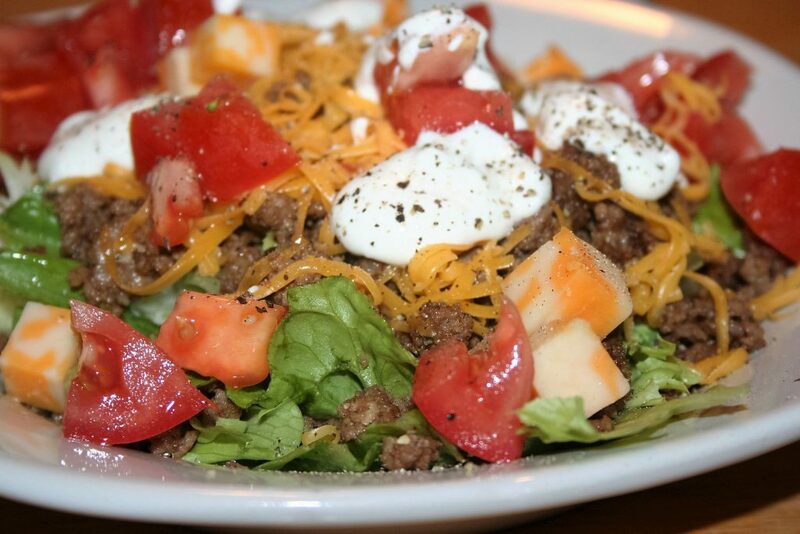 Serve salad with meat, cheese, sour cream, and tortilla chips or pork rinds, as desired. 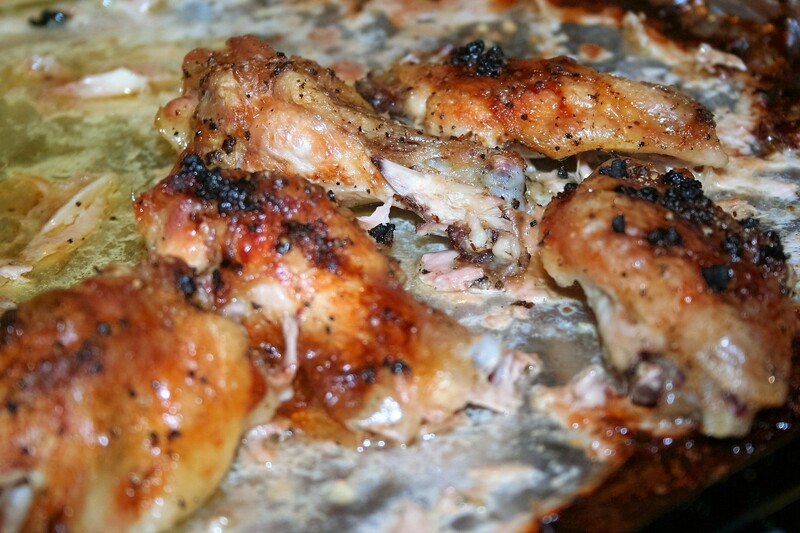 Quick to prep, easy, and delicious slow-cooked chicken wings. I had been watching some keto recipes on youtube, not too long ago where a couple of the vloggers talked about this easy recipe for chicken wings and said they were delicious. I’m not much of a wing fan but easy and delicious sounded good to me. So I bought a bag of wings to give it a try. 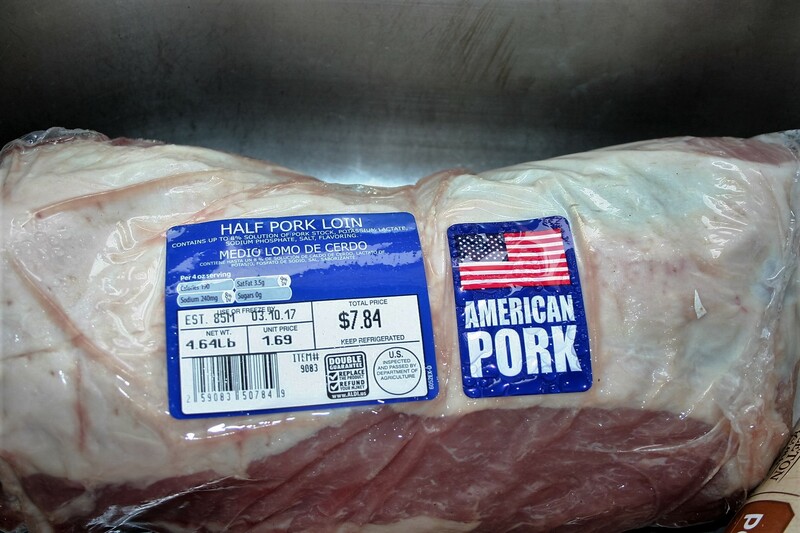 A four pound bag of chicken wings were about $8.99 at our local Aldi. Since I hadn’t bought wings before, I didn’t think that was a very good price until I checked them at another store or two. I decided it was an okay price after all. Michael, Tiffany, and I can eat a four pound bag easily. When Sean is eating them with us for a dinner, I make two bags but have some leftover for another time. Of course, if we had anything else with them them, one bag would probably be enough but I didn’t feel like making a salad and the kids don’t generally feel like eating a salad. 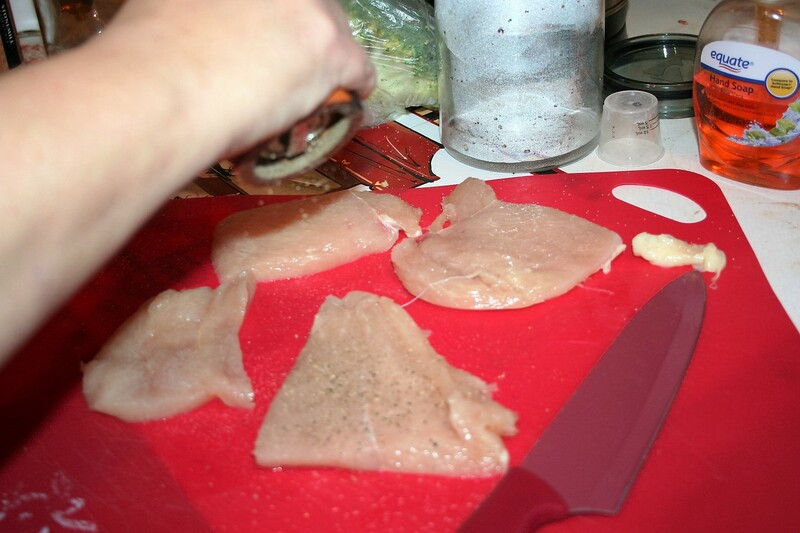 I like to thaw the wings first but you can just cook them a bit longer if you are cooking from frozen. Begin by covering a rimmed baking sheet with aluminum foil or I guess parchment paper would work if you are opposed to foil. 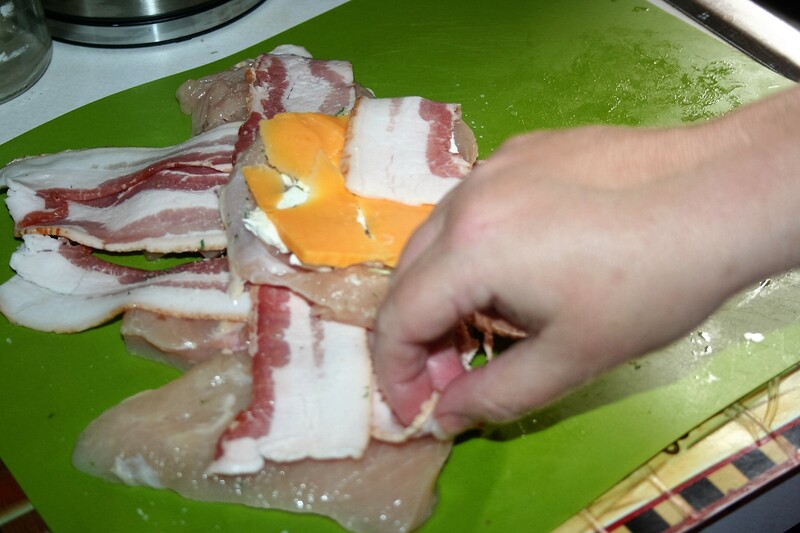 Spread the wings out in a single layer on the sheet. Place a thin slice of cold butter on each wing. 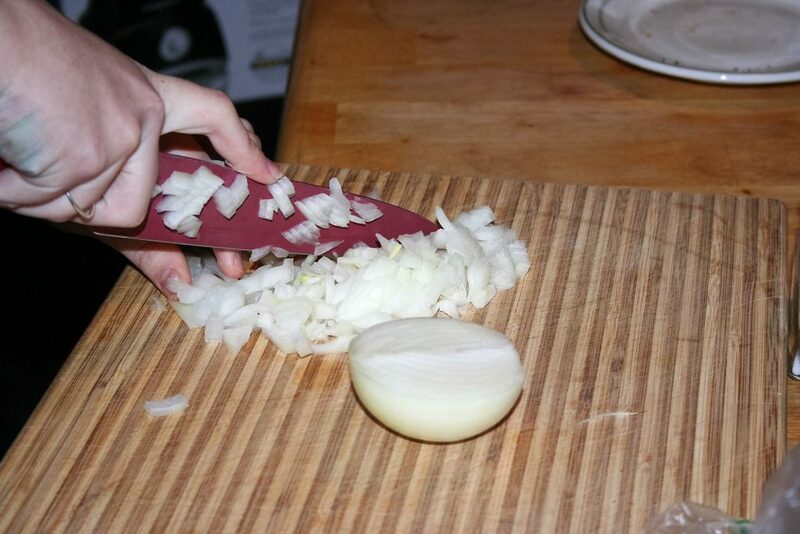 Then sprinkle with salt, pepper, garlic powder, and onion powder. 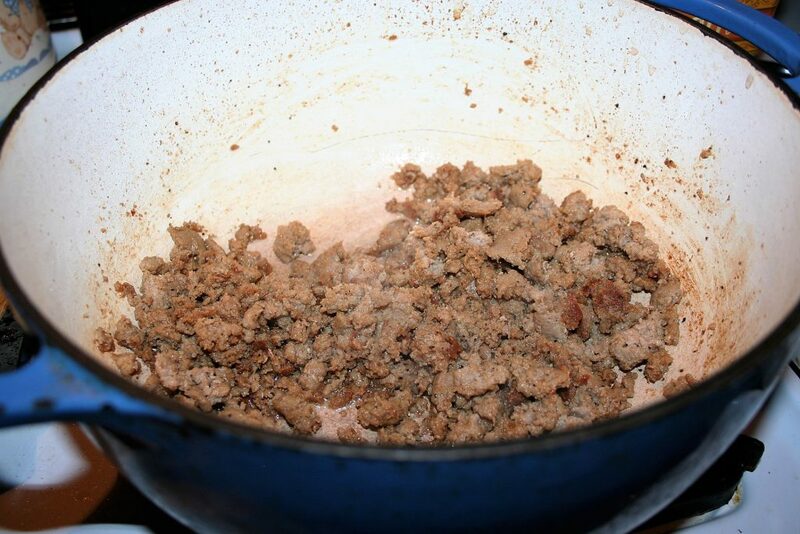 This was a picture from the first time I made them seasoned this way and I used some jarred minced garlic, which got a bit dark having been roasted for so long. So the next time I made them I just sprinkled them with a little garlic powder and onion powder, which tasted just as good. 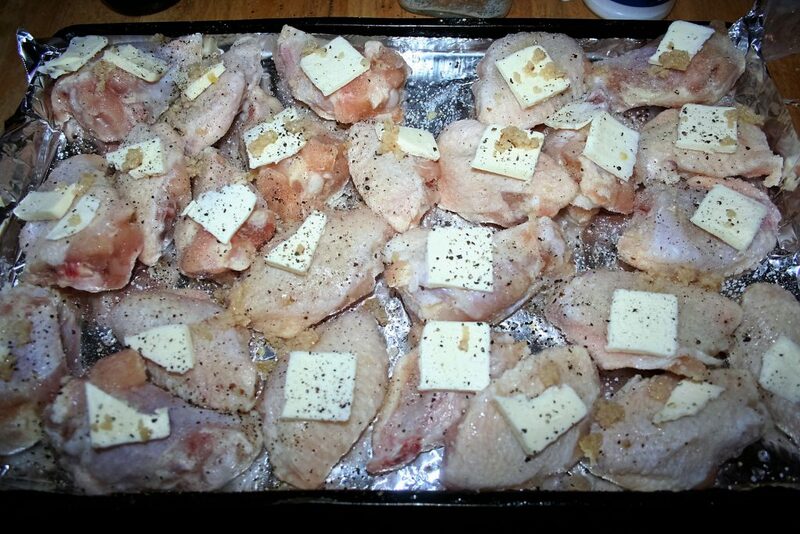 Put them in the oven on 250º. Yes that is right, 250º. Slow cook them for about 2 hours. 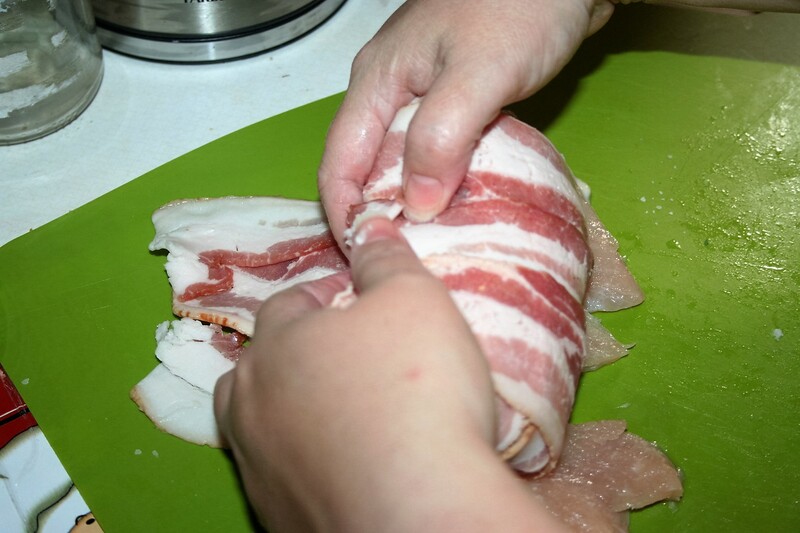 Then crank up the heat to 350º-400º depending on how impatient you are to eat. This takes around 20 minutes or so. 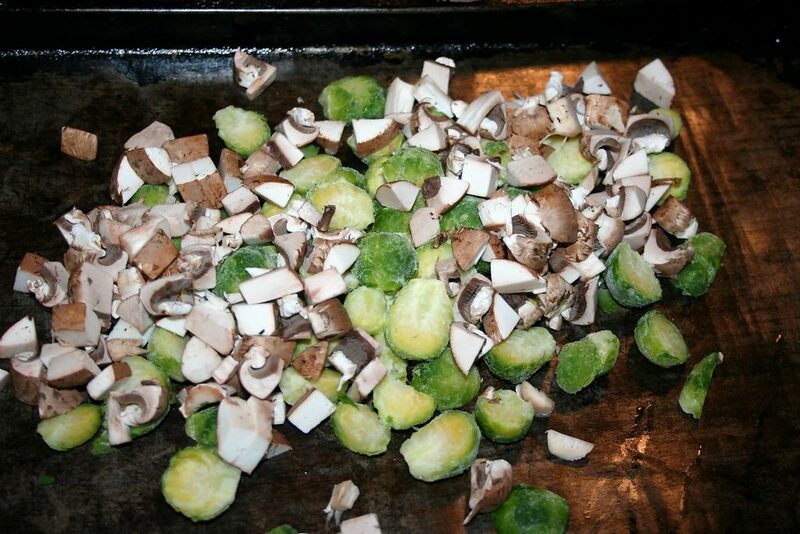 You want them to be browned and for a lot of the liquid in the pan to be evaporated. 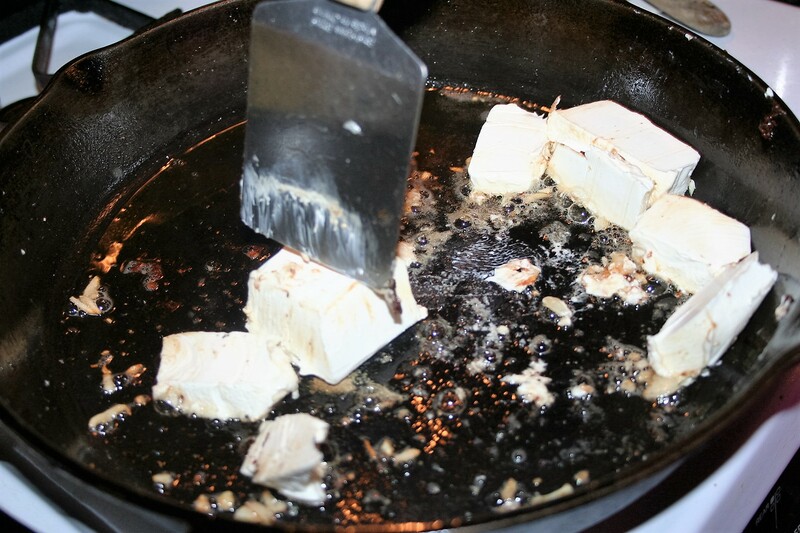 I used less butter on future pans because there was so much left in the pan when they were finished; so my thin slices of butter got even thinner. Sprinkle them with Parmesan cheese before eating. 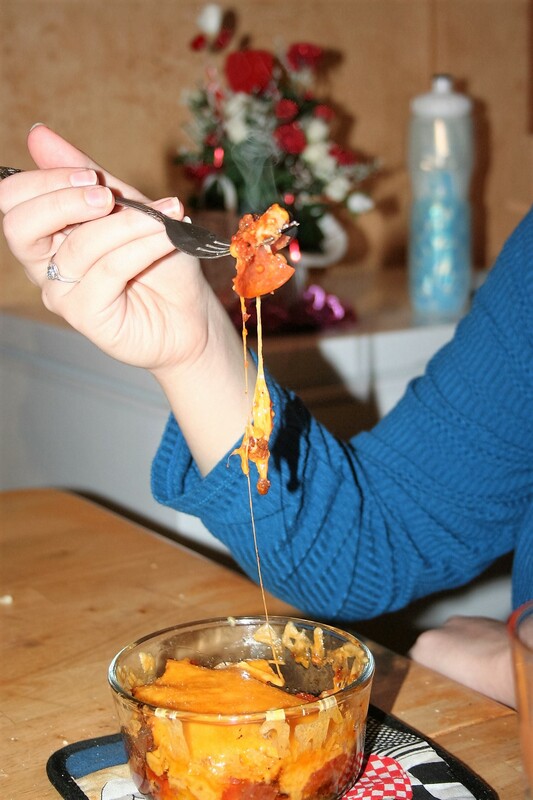 I think the next time I make them, I make sprinkle them as soon as I remove them from the oven or even pop it back in for a minute or two to melt that lovely cheese. Cover a rimmed baking/cookie sheet with aluminum foil. 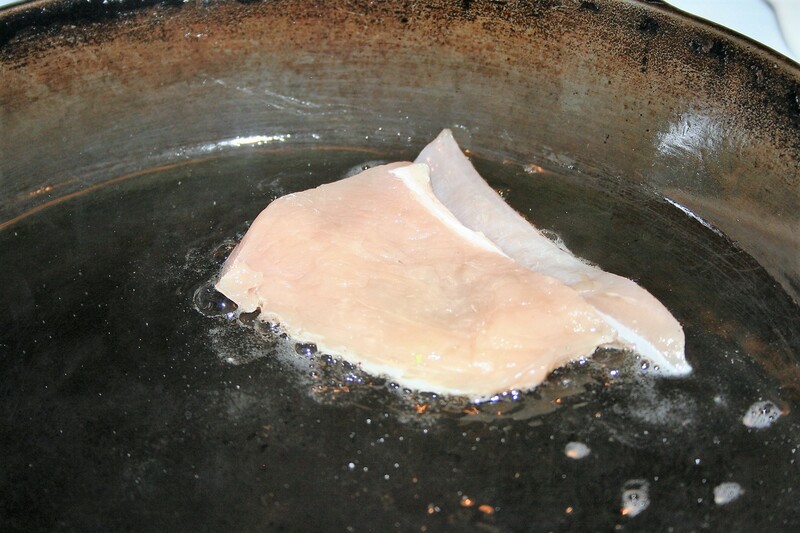 Spread wings on pan in a single layer. Put a small slice of butter on each wing. Sprinkle with salt, pepper, garlic powder, and onion powder (if desired). 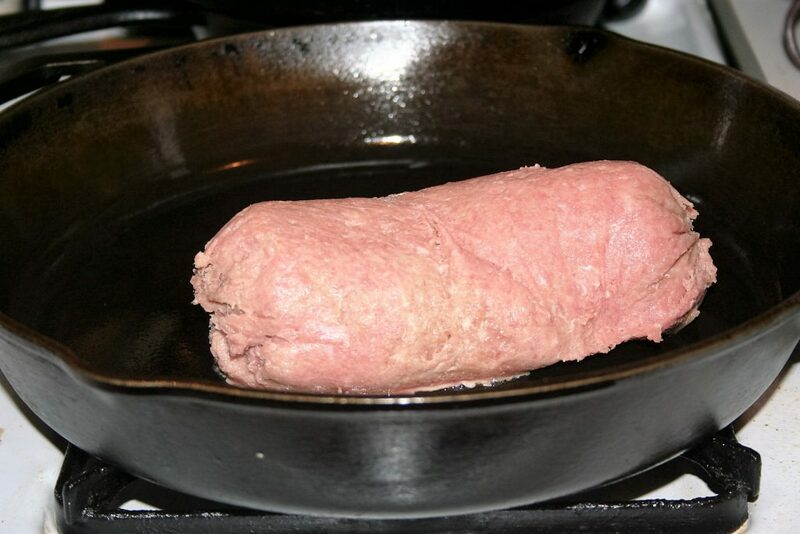 Bake at 250º for about 2 hours. 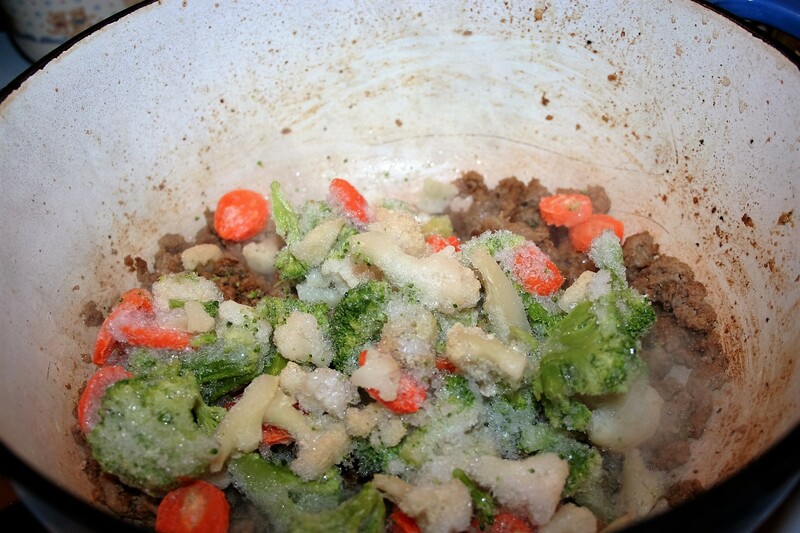 Sprinkle with shredded Parmesan cheese (or shaker Parmesan, if you prefer). I hope you enjoy these too. 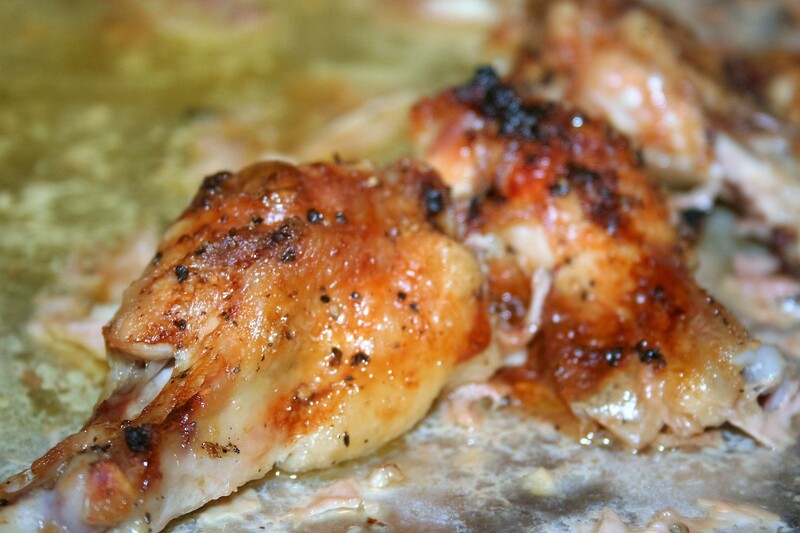 I’ll be sharing another wing recipe in the next few weeks that is even easier. 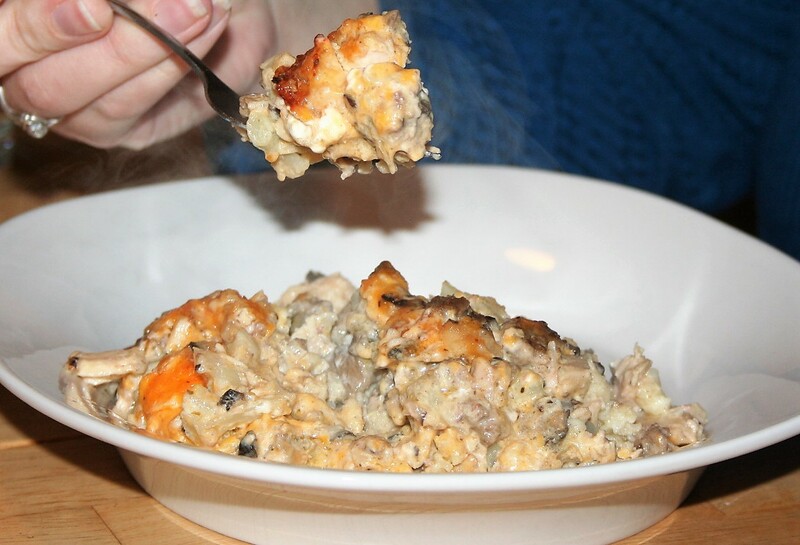 The combination of chicken, turkey sausage, mushroom, cauliflower and cheeses is like chicken and dressing without those carbs. 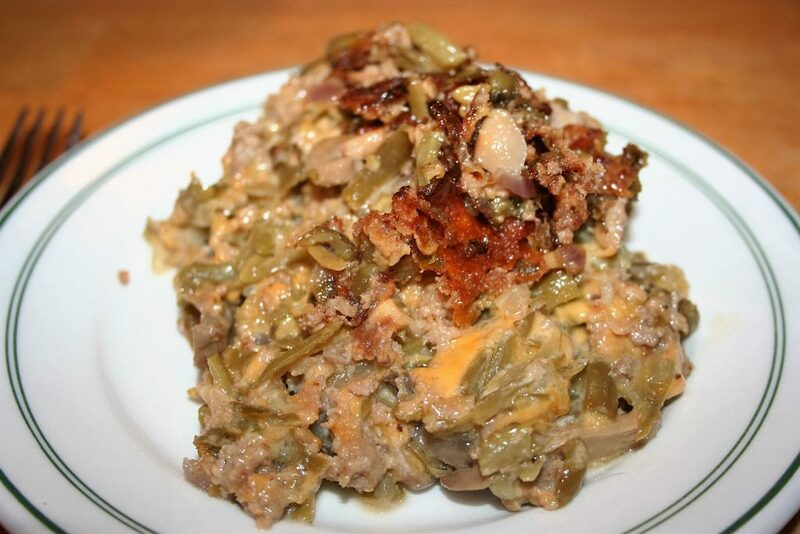 This is yet another wonderful recipe from Linda’s Low Carb Menus and Recipes. I don’t know why I don’t make this more often. We really like it and it is tasty. 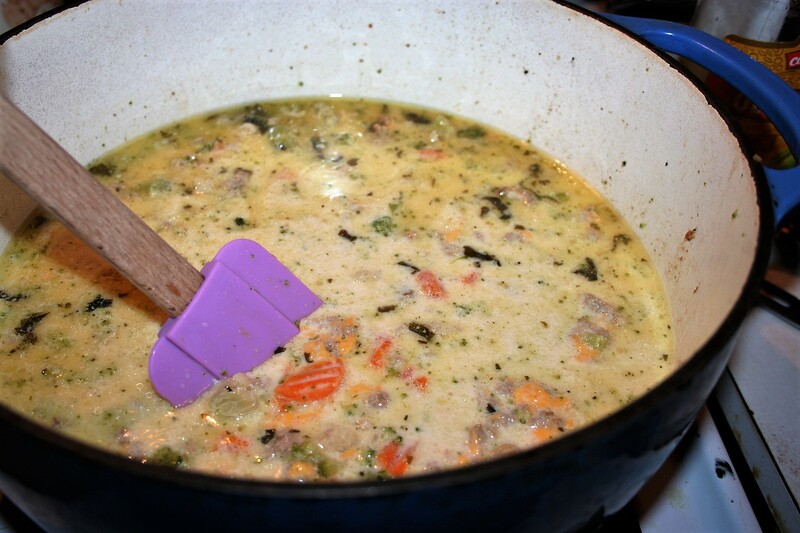 It tastes almost like chicken and dressing, at least when I make it with turkey sausage; I don’t think I’ve ever made it with pork sausage. 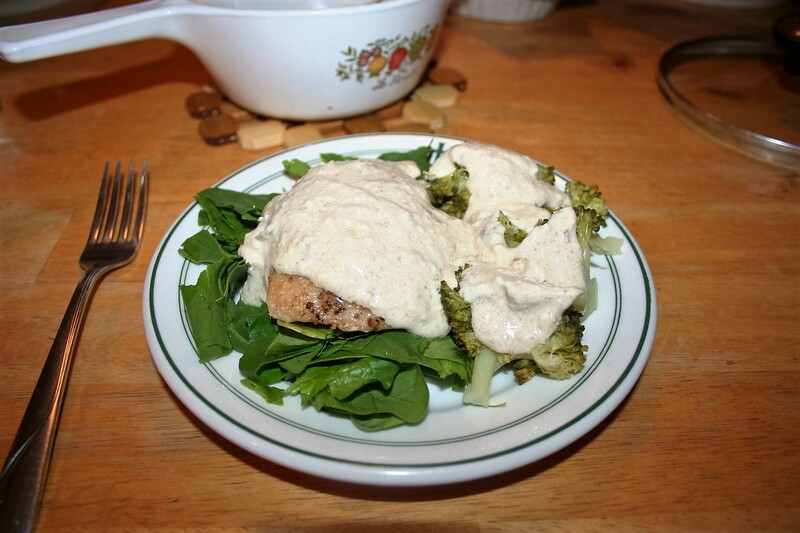 It is another of the recipes that I found when I did the hCg diet and was on phase 3. 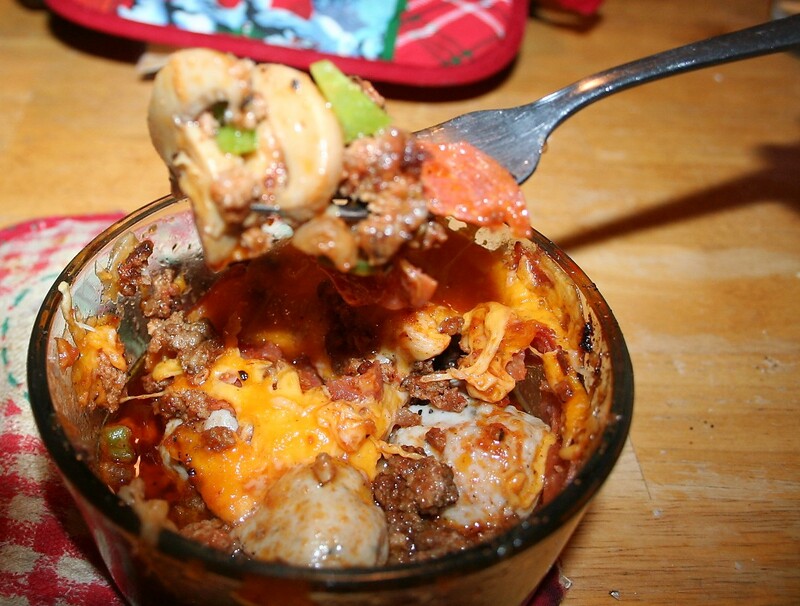 However when I was watching calories, I tried making it with less cheese and it just wasn’t creamy enough. 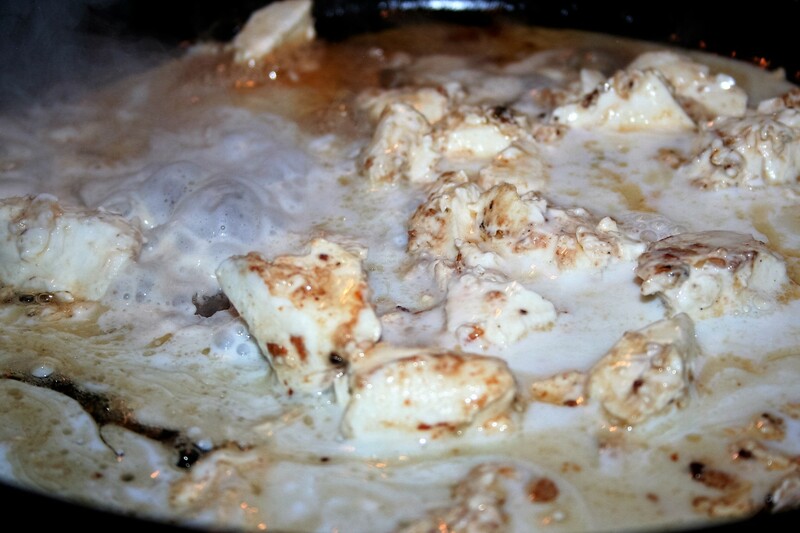 But when you include all sixteen ounces of cheese and your cauliflower is nicely cooked, it is just delicious! 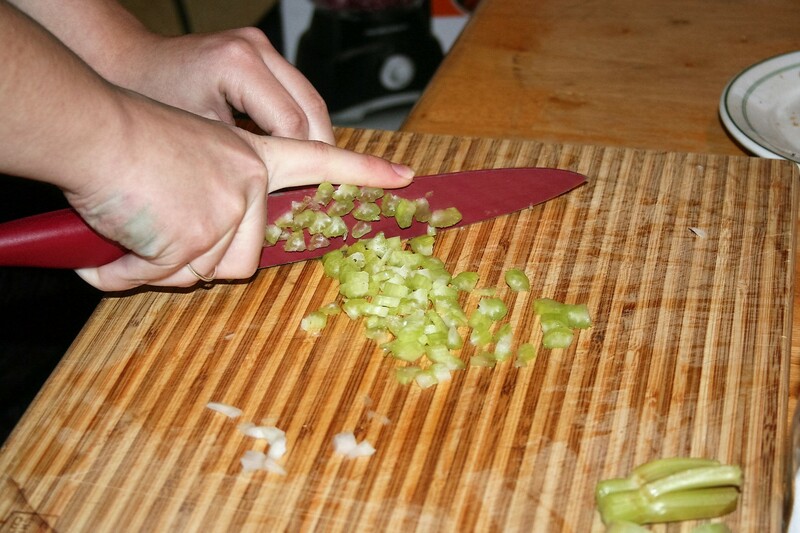 Dice the celery and onion. 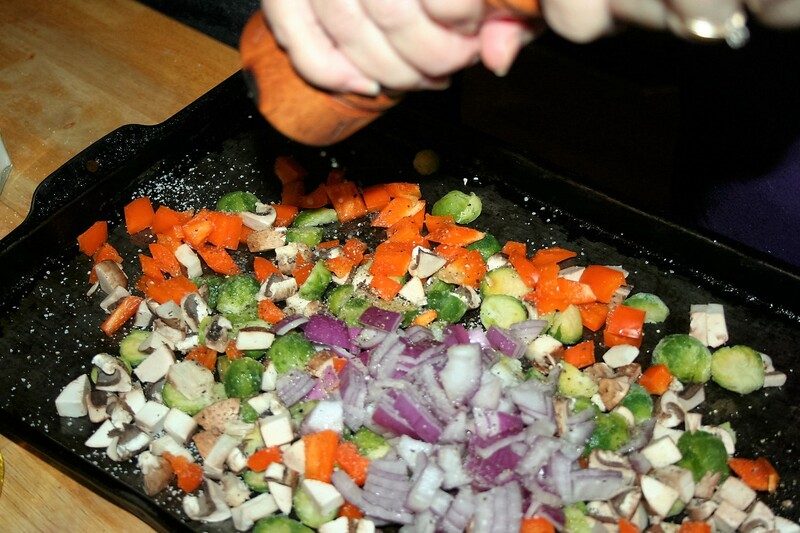 I do it finely, because we do not like chunky crunchy veggies in our casseroles. I start by sautéing them in a little coconut oil; I use refined coconut oil so there is no coconut flavor. Tiffany went a little overboard on the onion this day. It was still delicious. 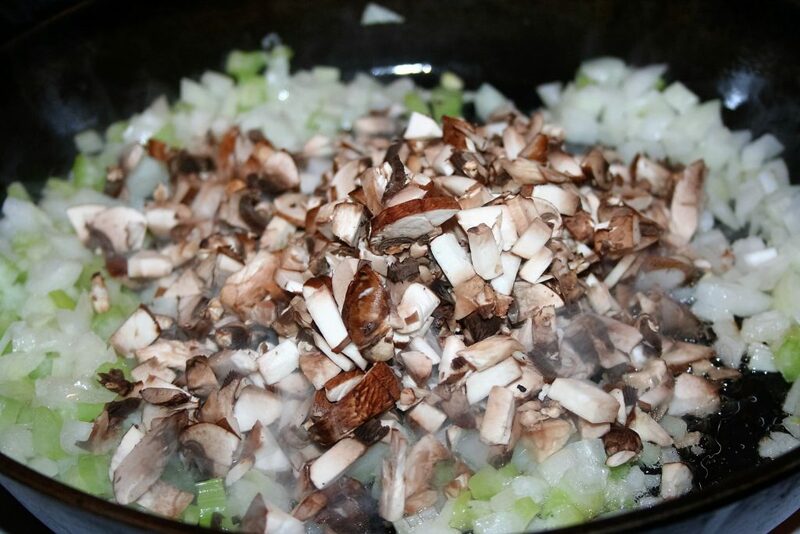 Add in the diced mushrooms. We don’t use the entire package, only about four ounces worth because Sean does not care for them. 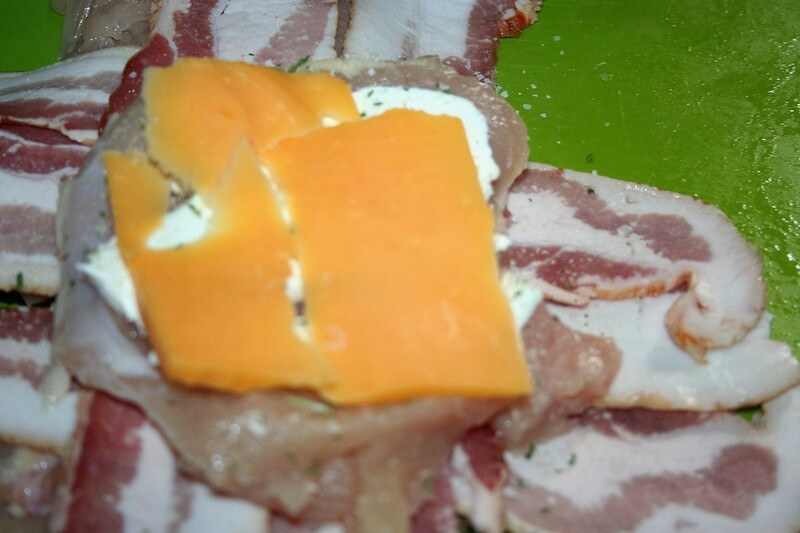 This is also why they are diced into small pieces rather than simply sliced. I like to lightly salt these because salt helps them release water and thus, speeds the cooking process. When these veggies are well on their way to losing their crunch, I add the sausage to brown. 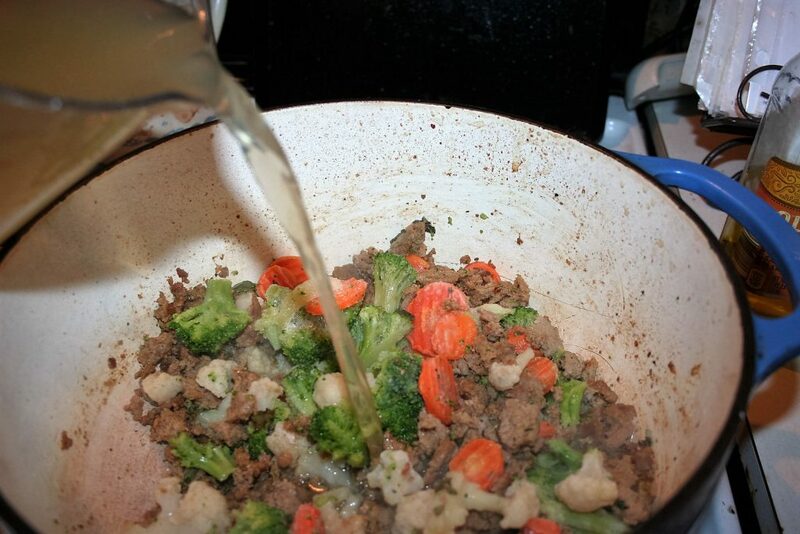 While that is browning, I steam my cauliflower, unless of course, I have forgotten about it and need it quickly. In which case, I steam it in the microwave. 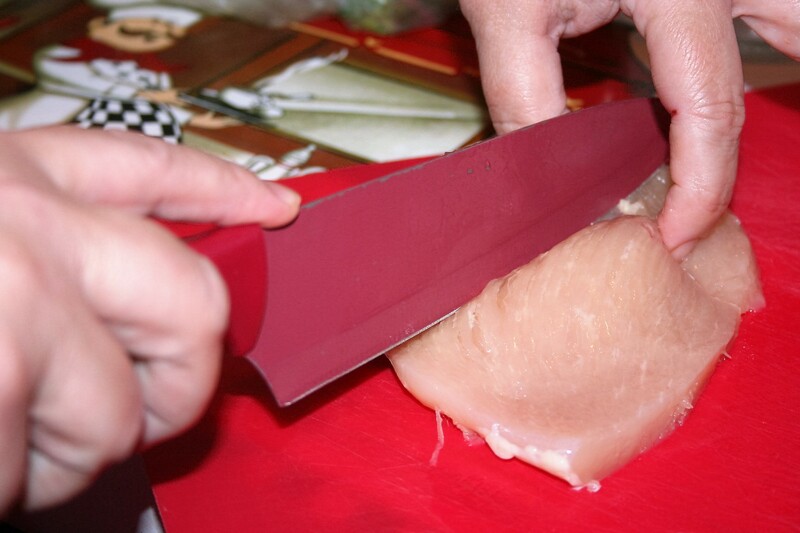 Then give it a course chop. 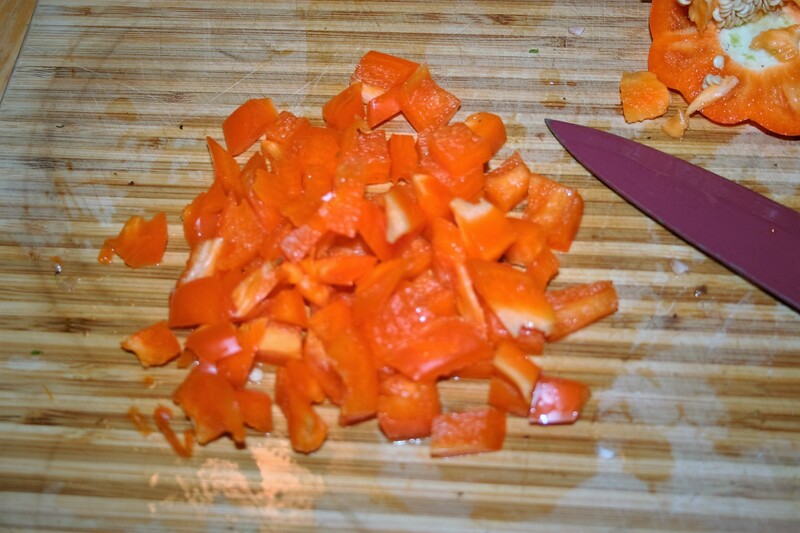 It’s already cooked and has lost it crunch so I don’t have to chop this too finely. 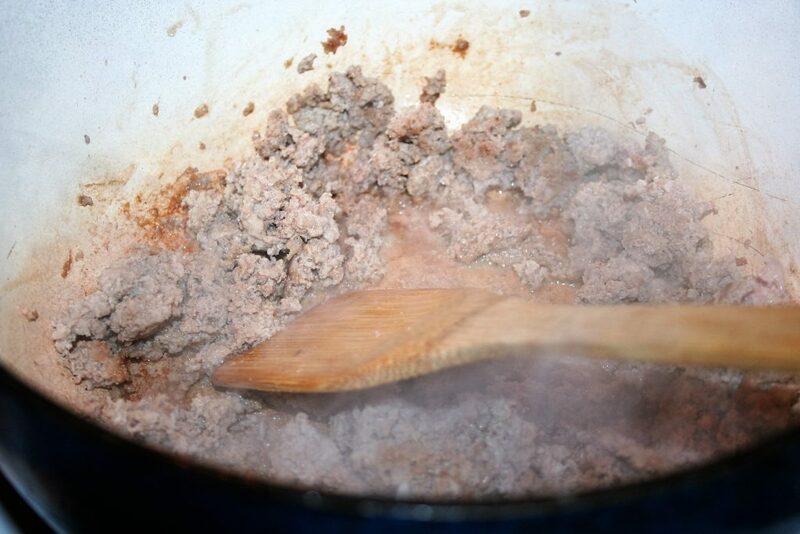 After the sausage is browned, add in the softened cream cheese and blend it in well. 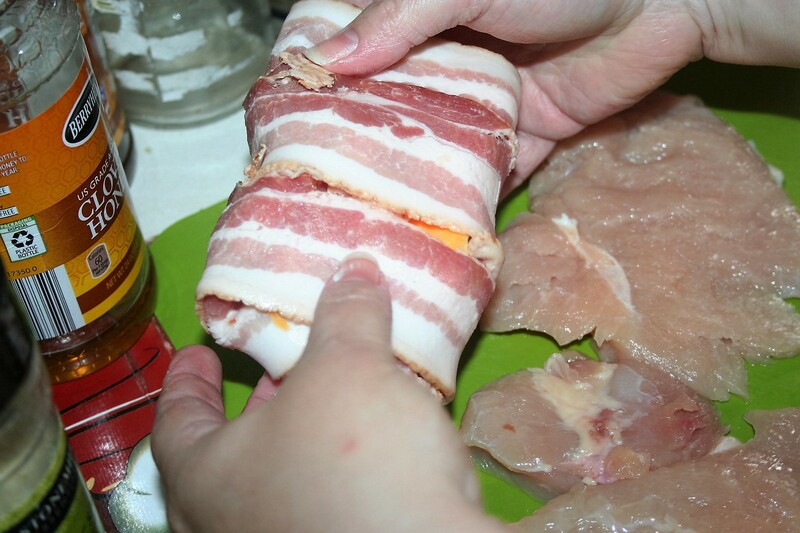 Add in the cooked chicken, cheddar, salt, and pepper. 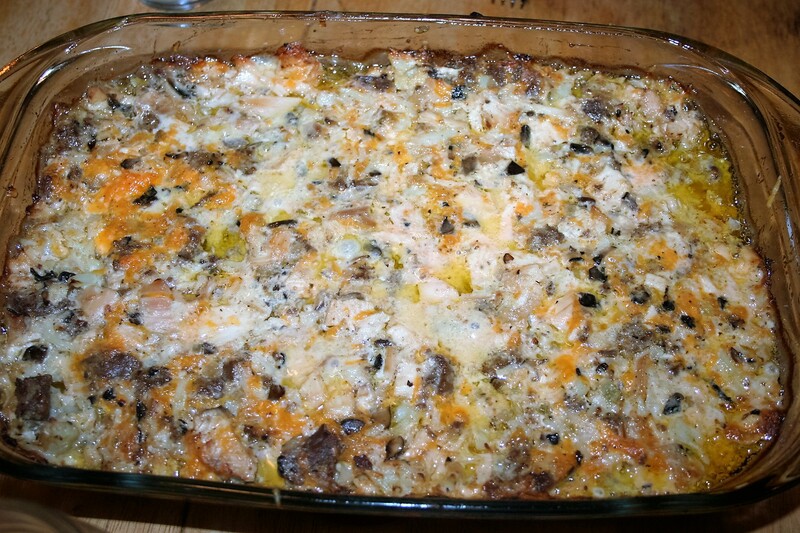 Spread into a greased 9×13 baking dish. 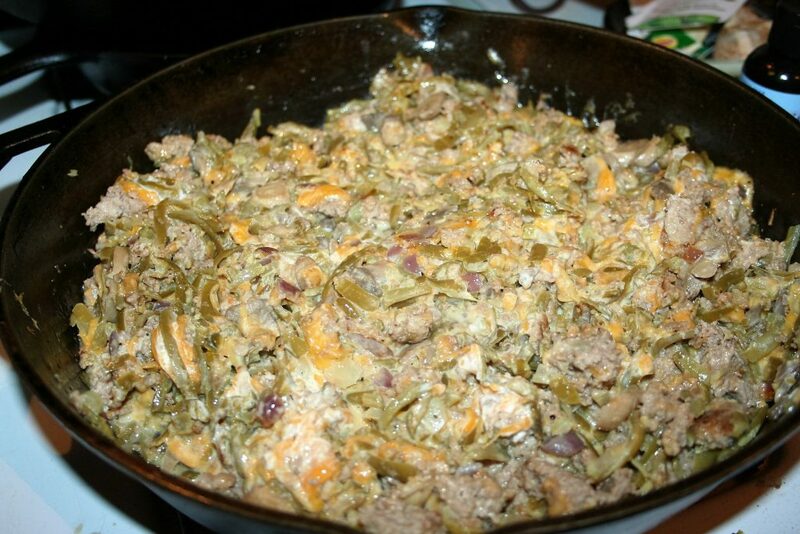 This is a hearty dish and there will be leftovers, even when I serve it to four hungry adults with no side dishes. 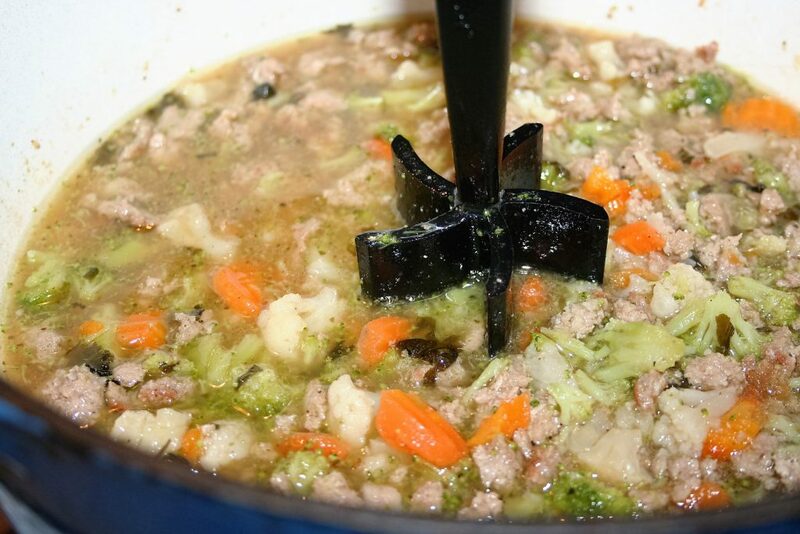 Add coarsely chopped cooked cauliflower and the rest of the ingredients. 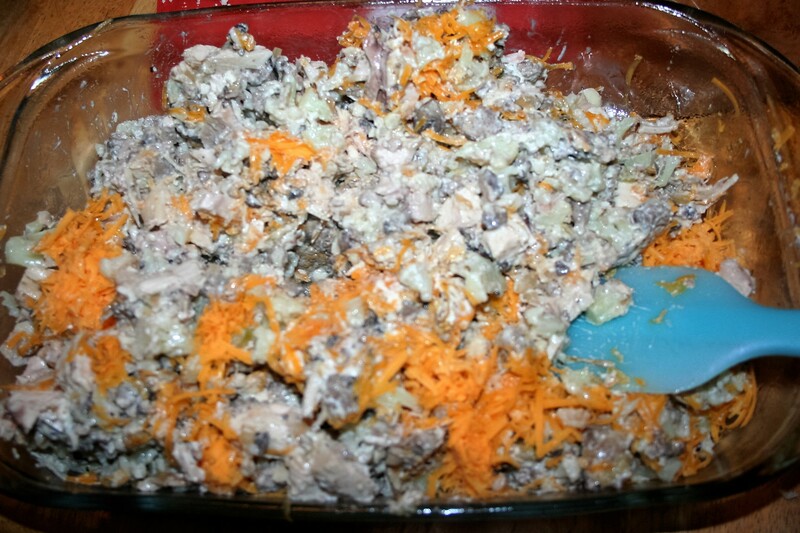 Spread into a greased 9x13 baking dish. Bake at 350º about 40 minutes until the cheese is completely melted and top slightly browned. 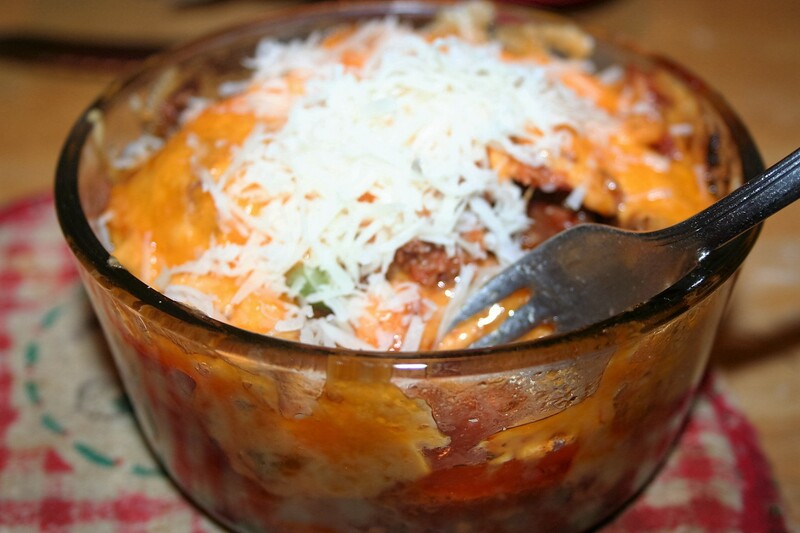 Very meaty bowls of deliciousness with lots of cheese! This is a recipe I found years ago, shortly after I’d started my first low-carb diet. I copied it out of a book from the library but have been tempted to call it pizza bowls because it has all the things I love on pizza. 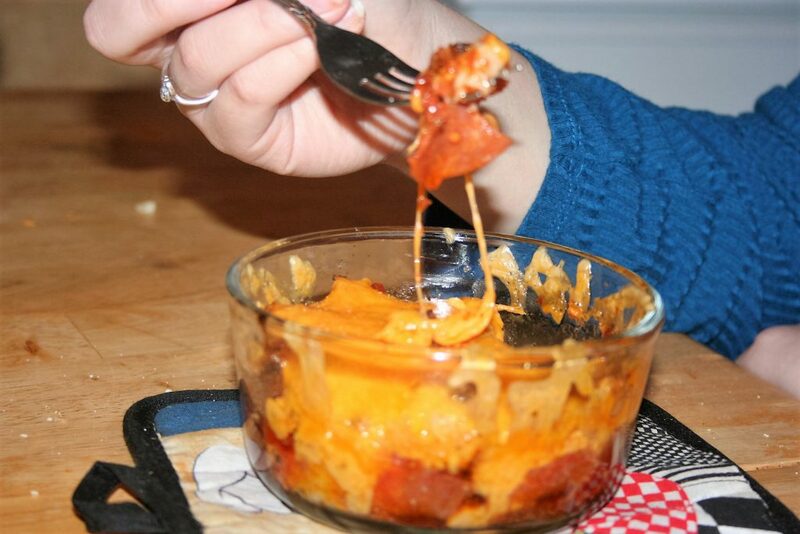 It’s just that it doesn’t have enough sauce to really be a pizza bowl and of course, there’s nothing replacing the dough/crust. 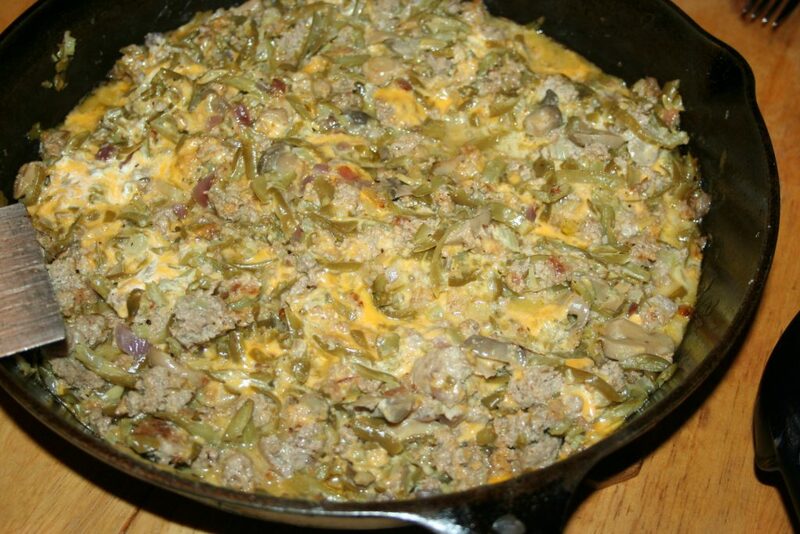 In the end, I opted to just leave it as meaty casserole. So this is pretty simple and doesn’t take very long to accomplish either. 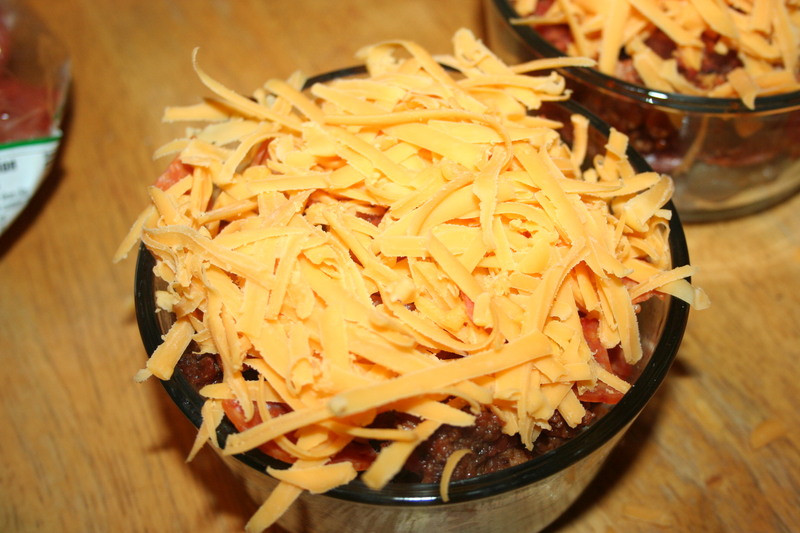 It is made in individual serving bowls, so can be made to order. 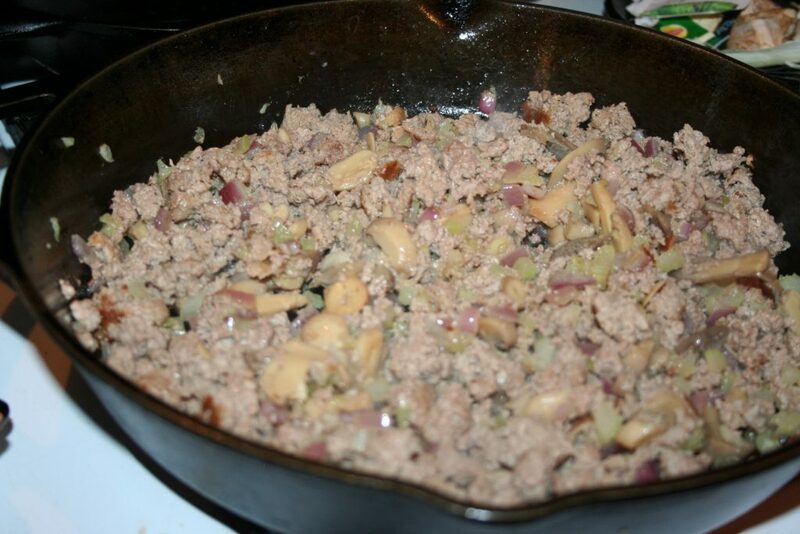 Thus, the kids and I use ground beef and Michael gets ground turkey. So begin by browning the ground meat. Season it with salt, pepper, onion powder, and garlic powder. 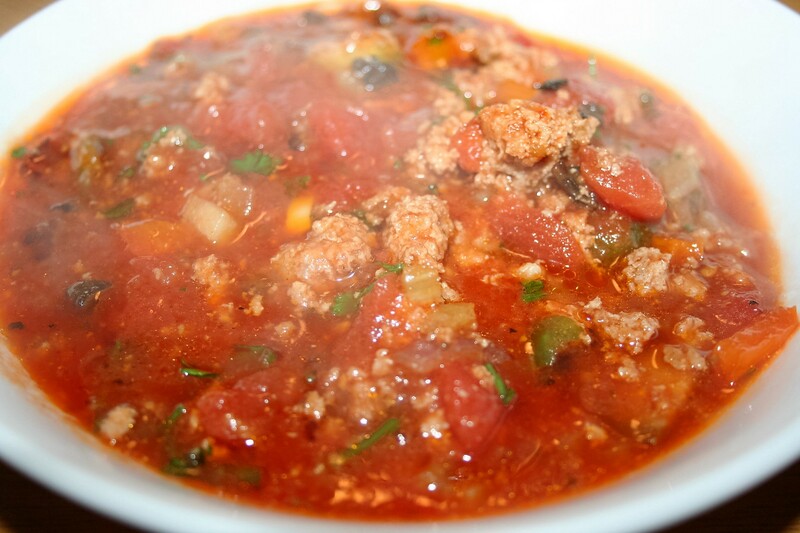 Add diced tomatoes, which I choose to puree with a stick blender. 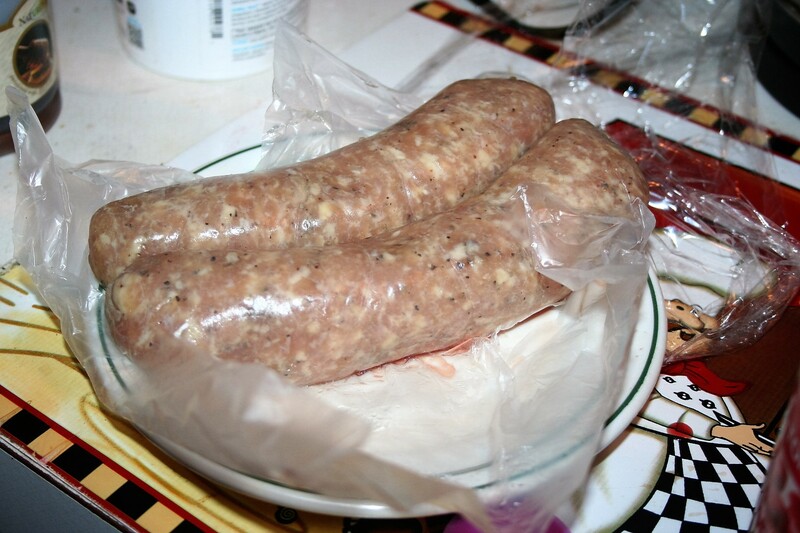 Meanwhile, make sixteen meatballs out of the Sweet Italian Sausage links. I don’t know how large the links are generally but these are rather large. I ended up only using one and a half. 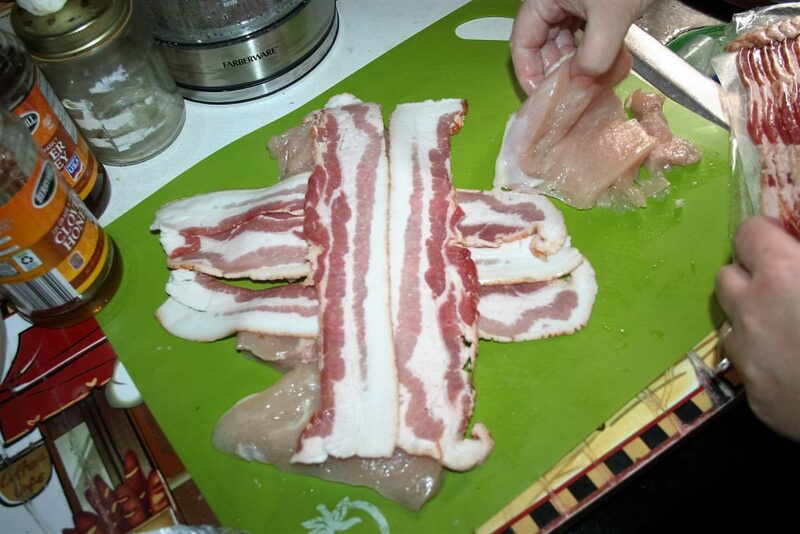 I think I’ll make twice as many but half as big, next time, since it is difficult to cut them when eating them. Smaller would definitely be better. Who knows, maybe there are only supposed to be four that size. Next add additional ‘toppings’. 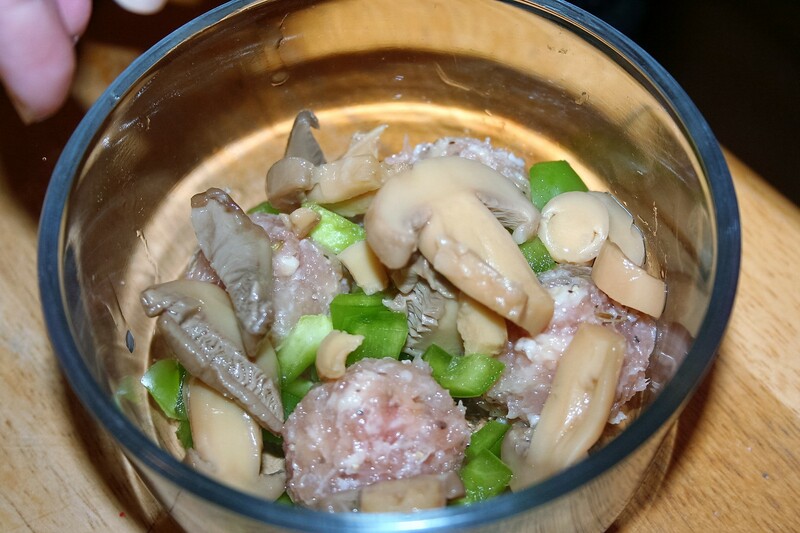 I add canned mushrooms and diced green pepper to Michael’s and mine. Sean and Tiffany do not care for those items. Next comes pepperoni, which I cut into quarters, so it’s more bite-sized. I like to put some pepperoni before and some after the ground meat. 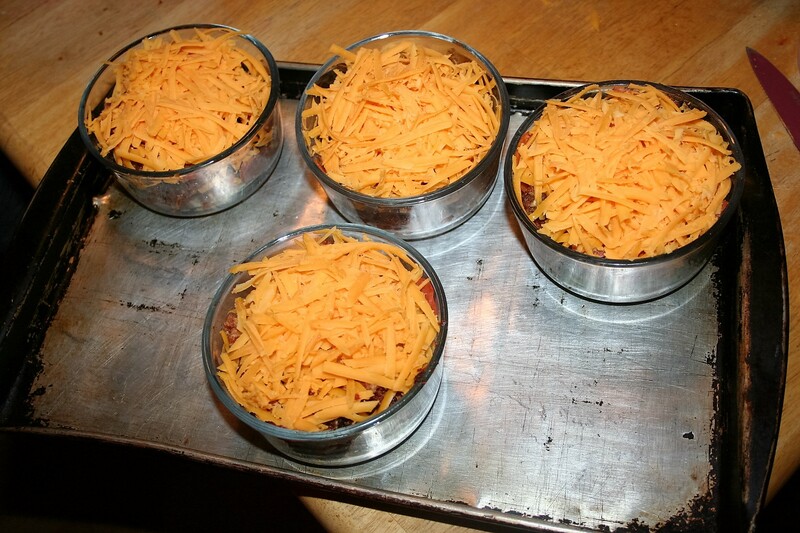 I like to put them all on a rimmed baking sheet so that it is easier to move them. 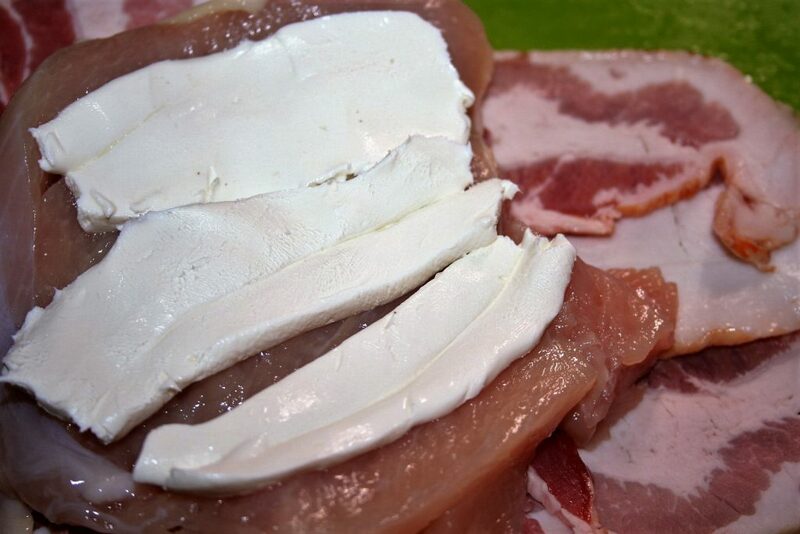 Bake at 400º for 15-20 minutes, until cheese is melted and bubbly. It’s supposed to have the shredded parmesan cheese added before baking but I always forget until just about the time I go to put it in the oven and then I’m in too big of a hurry, and decide to just wait until later. 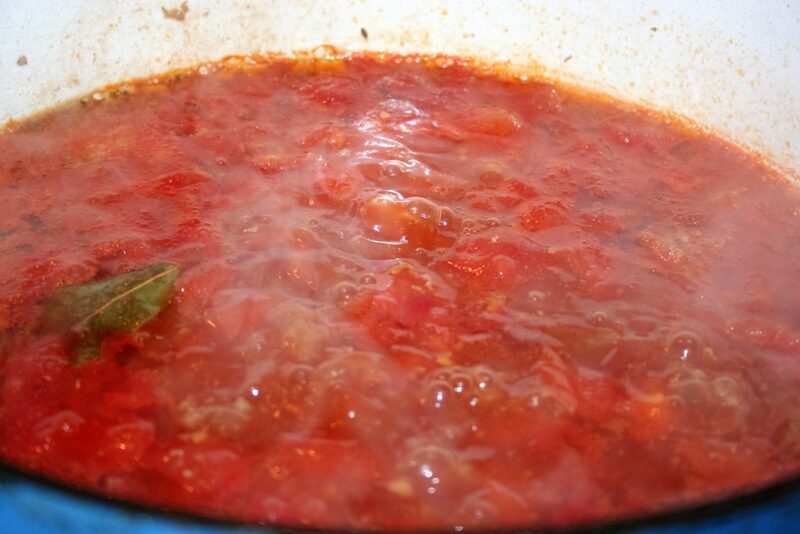 Add tomatoes, which I purée first. 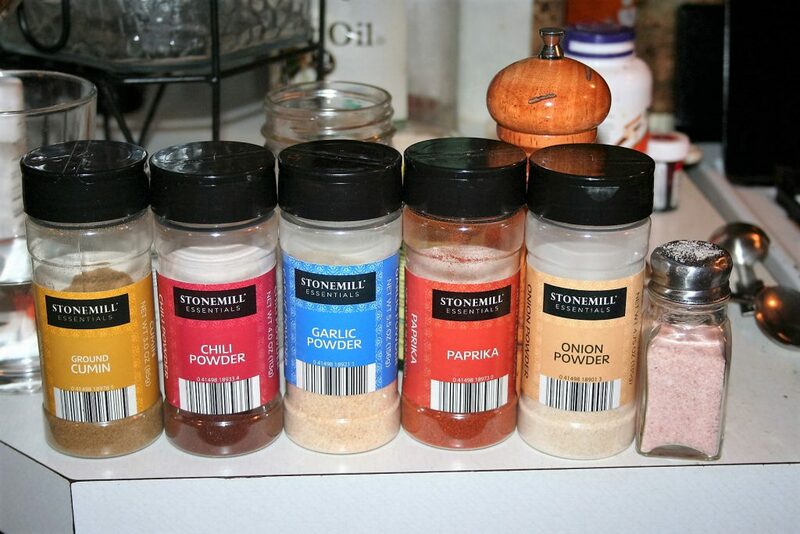 Add 1/8 teaspoon or less of baking soda along with the other spices, salt and pepper. 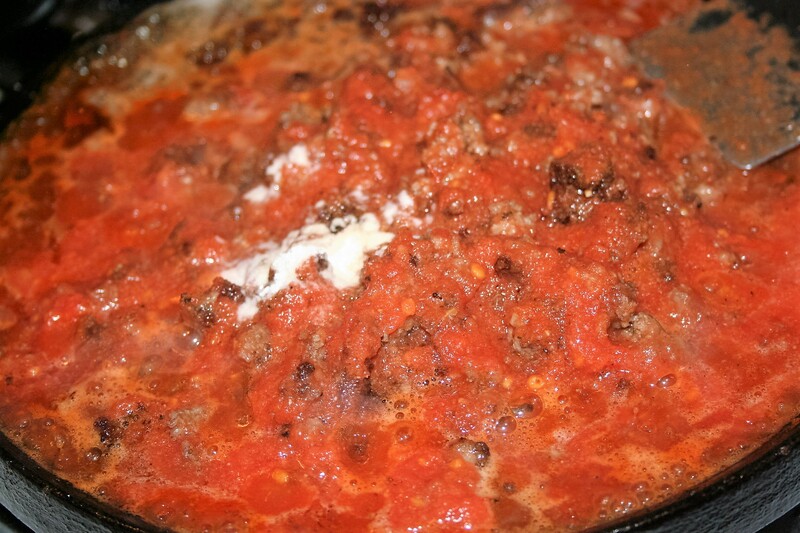 Cook until sauce thickens, about 5-8 minutes. 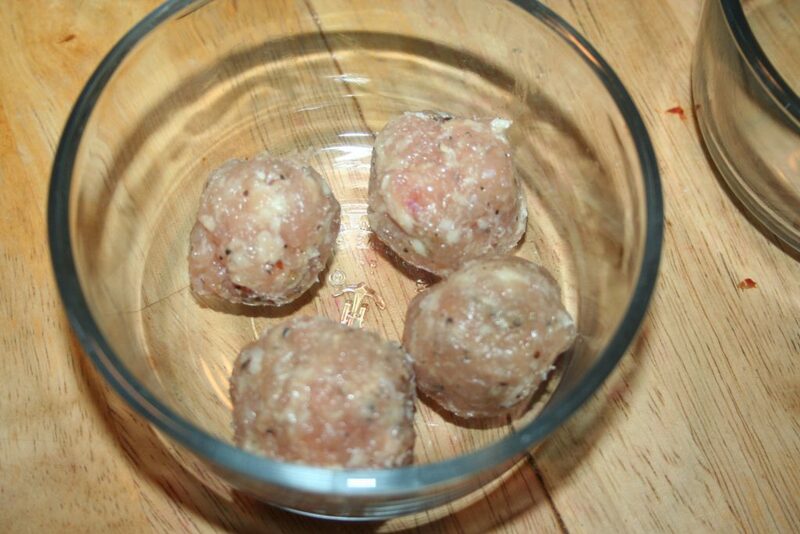 Remove casing from Italian sausage and form into 16 small balls. 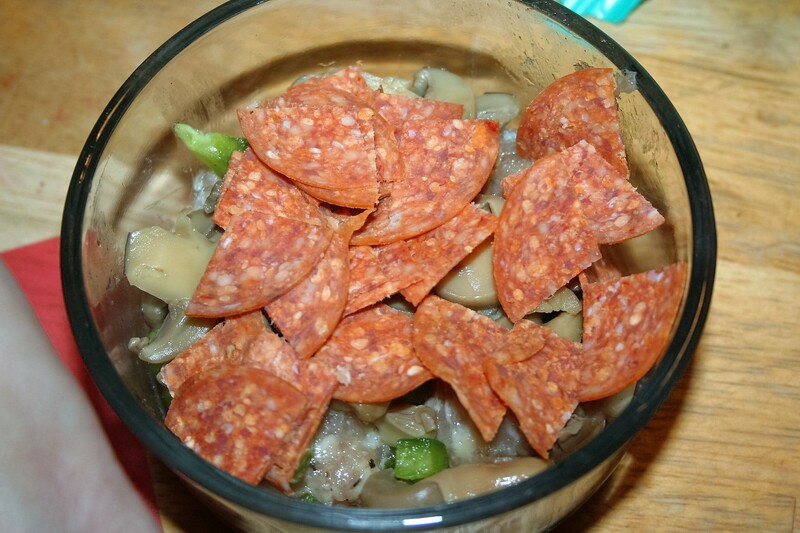 Divide sausage, pepperoni, green pepper, and mushrooms between individual dishes. 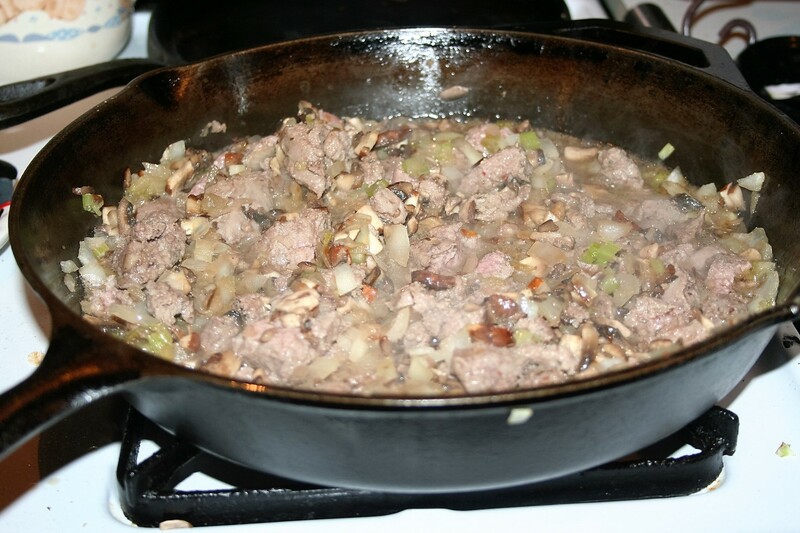 Add beef mixture to each. 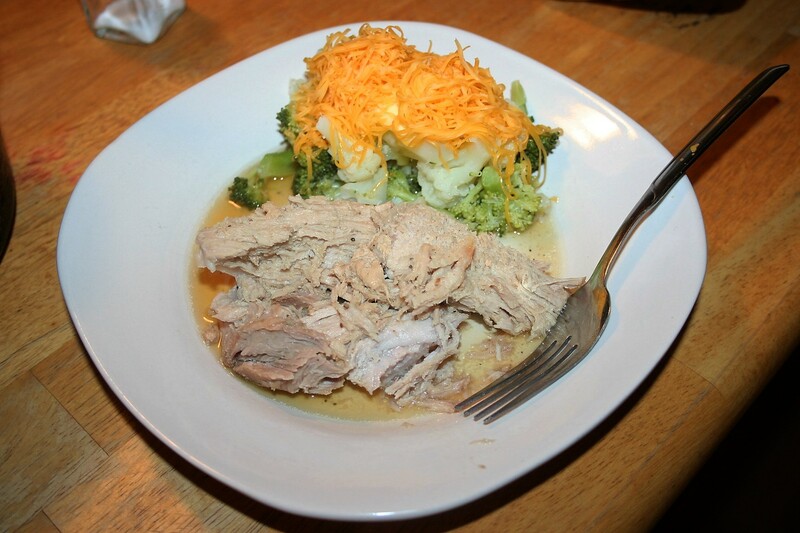 Top with 1/2 cup shredded cheese and 1 tablespoon Parmesan cheese. 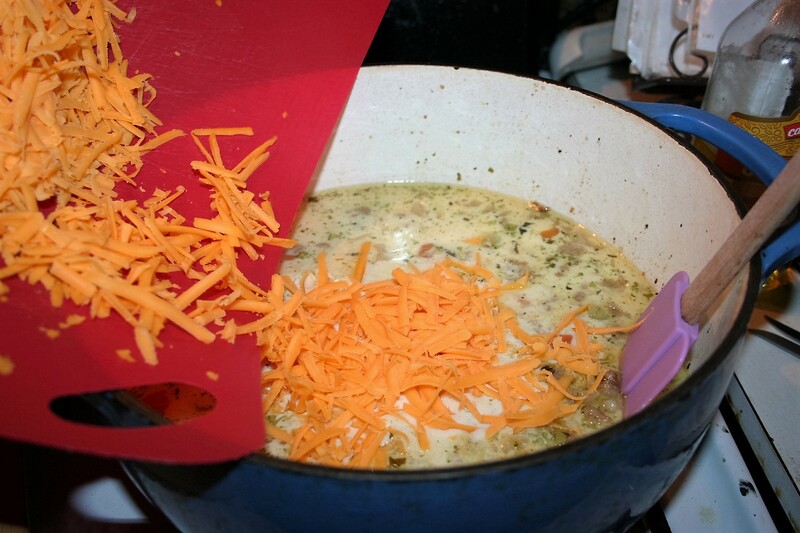 Bake 15-20 minutes, until cheese is melted and bubbly. I hope you enjoy these. We have. 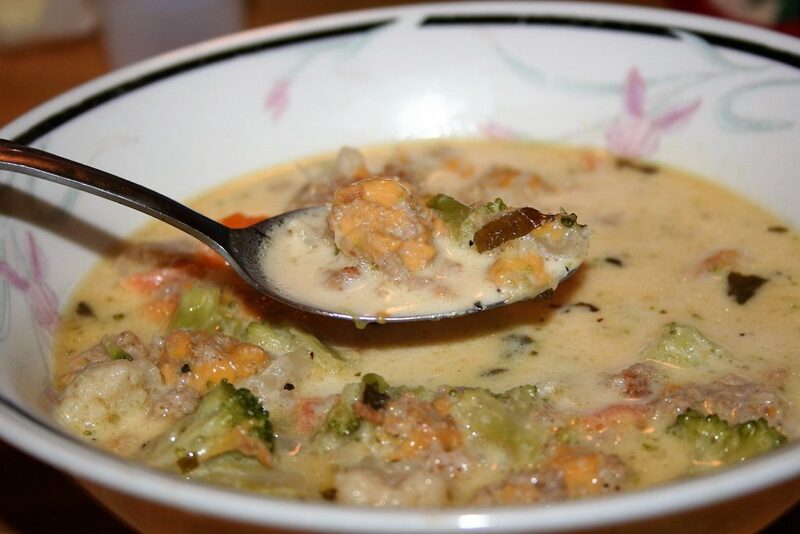 This is a satisfying creamy, easy to make entrée. It is good served over raw spinach or with broccoli. I got this one from a menu-planning service YEARS ago. I think it was the first one of its kind-actually, I think she invented the whole concept. At any rate, I had been given a small gift from my aunt for Christmas and had been wanting to try out this service. As it turned out, they were having a special that week, so I paid for something like a six-month subscription and got three months free. 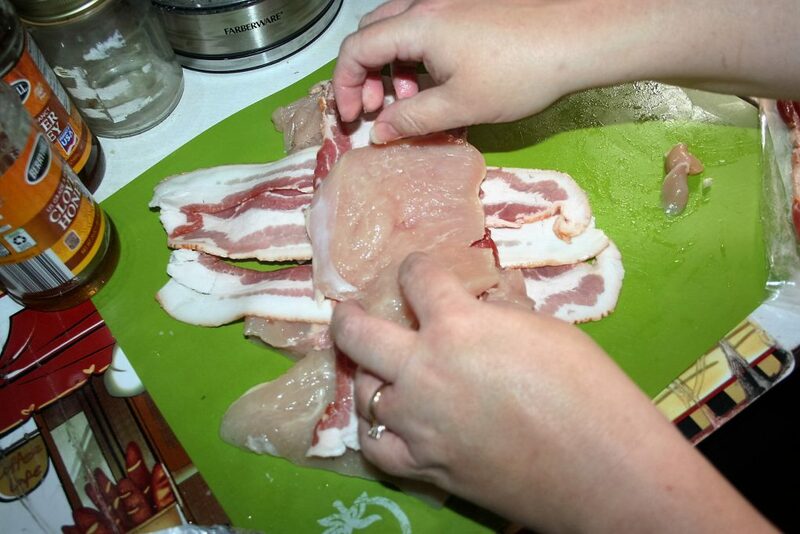 It was a great help to me since I was on the Atkins diet at the time. Oh! she had two versions: regular and low-carb. 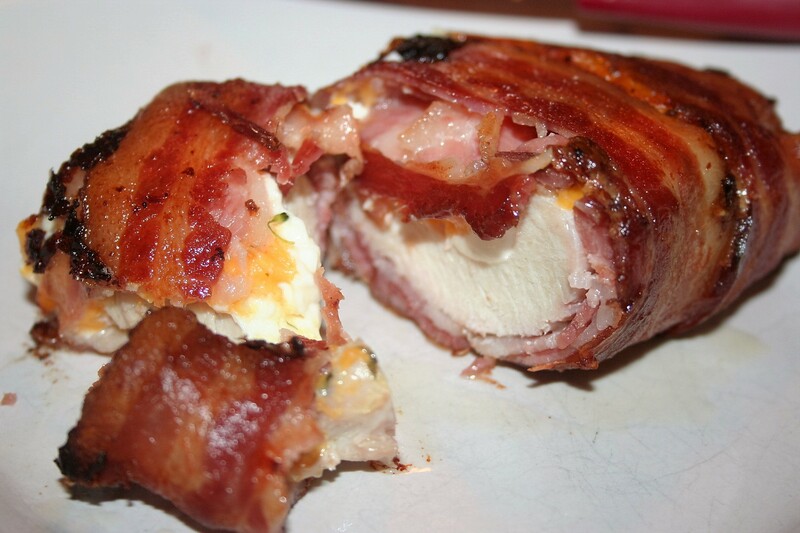 As you can probably surmise by now, I got the low-carb one. 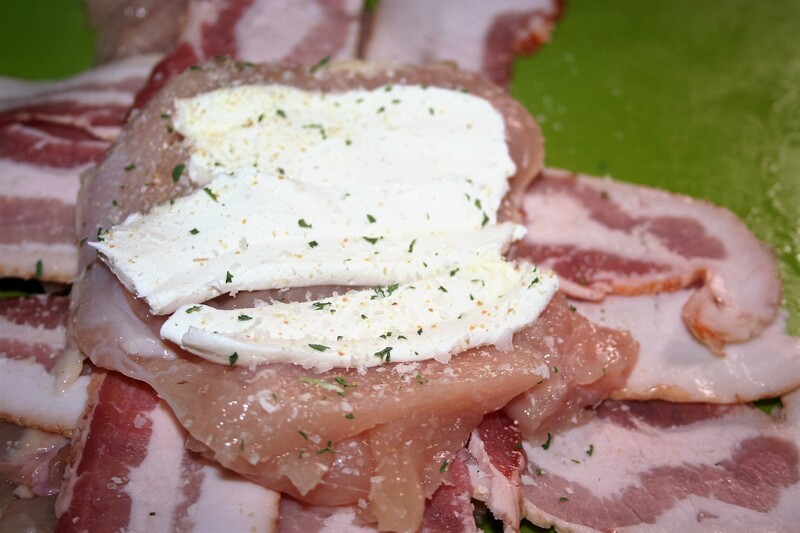 The original recipe, and the one we tried first, used pork chops, so feel free to substitute the meat. 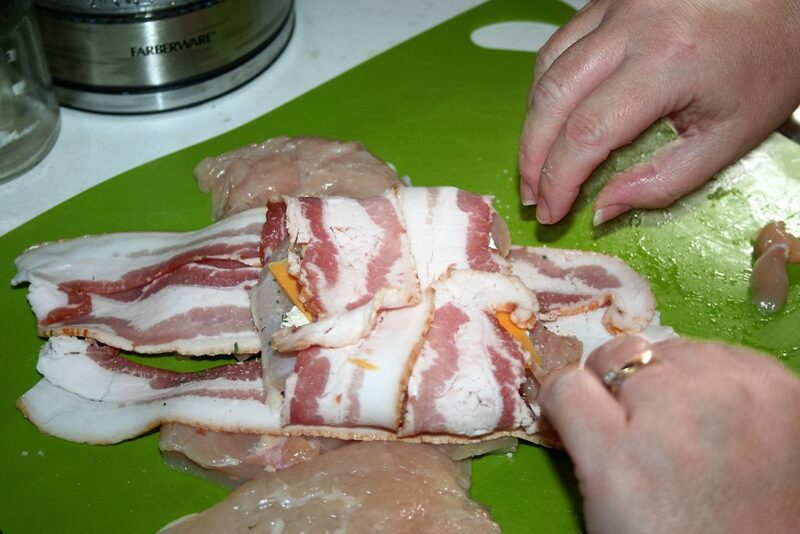 However, I was going through my recipes for something different to eat and happened upon this one. 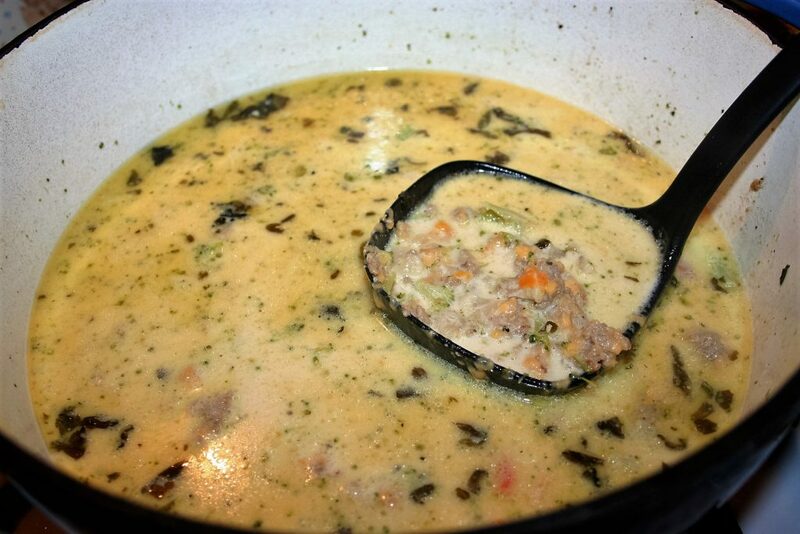 I realized that I could substitute chicken for the pork, and we could enjoy this recipe once again, since Michael couldn’t eat pork because of a reaction he gets when doing so. 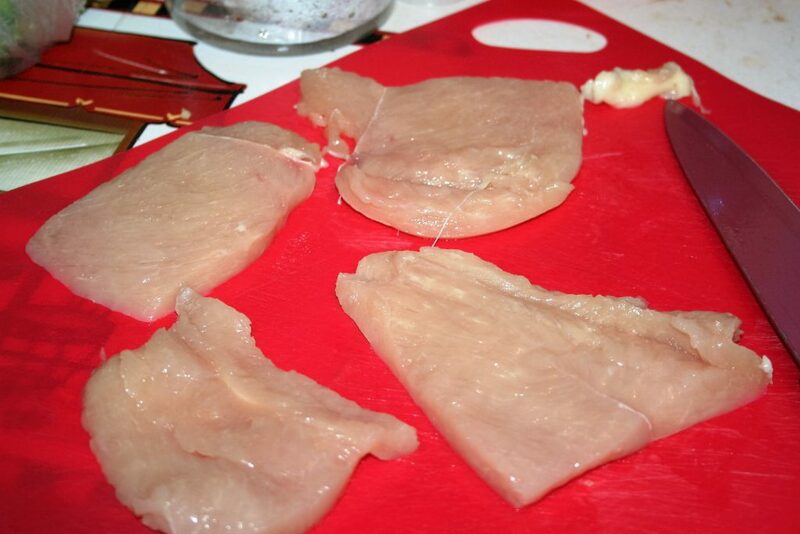 A one pound breast is rather large. So I cut it in half horizontally and vertically, creating four smaller pieces weighing about a quarter pound each. Salt and pepper each piece. 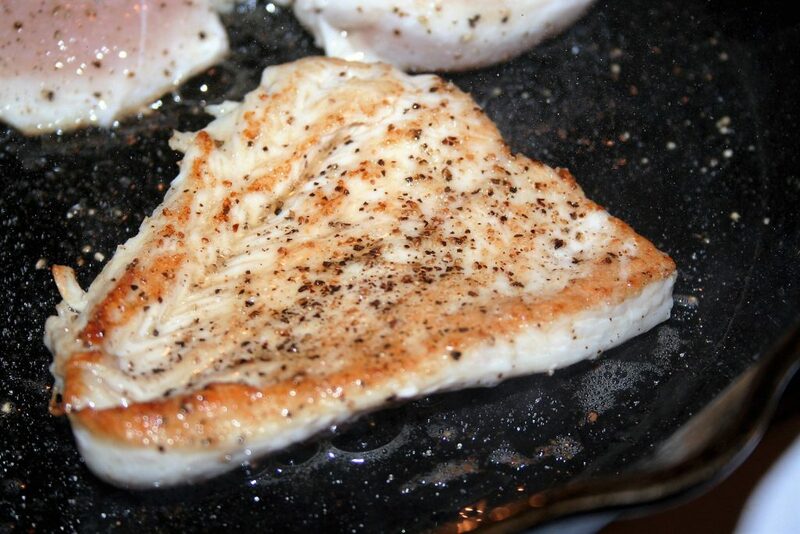 Melt some butter, olive or coconut oil in a skillet and sauté the chicken a few minutes on each side. 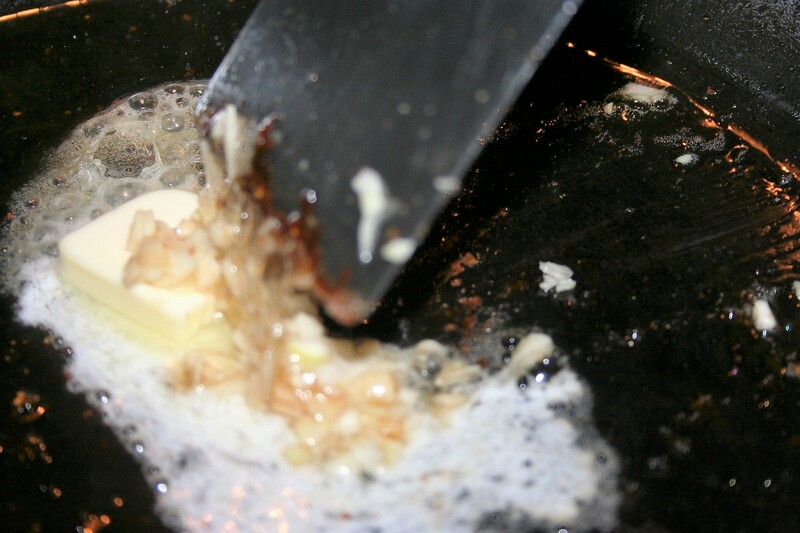 Add the butter to the pan and melt, over medium heat. 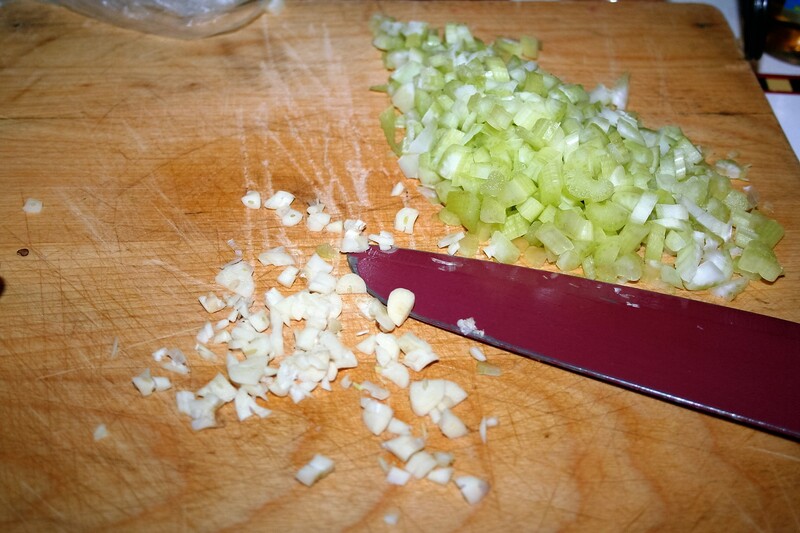 Add garlic and cook for a minute or so. Be careful not to burn it or you’ll need to start over. 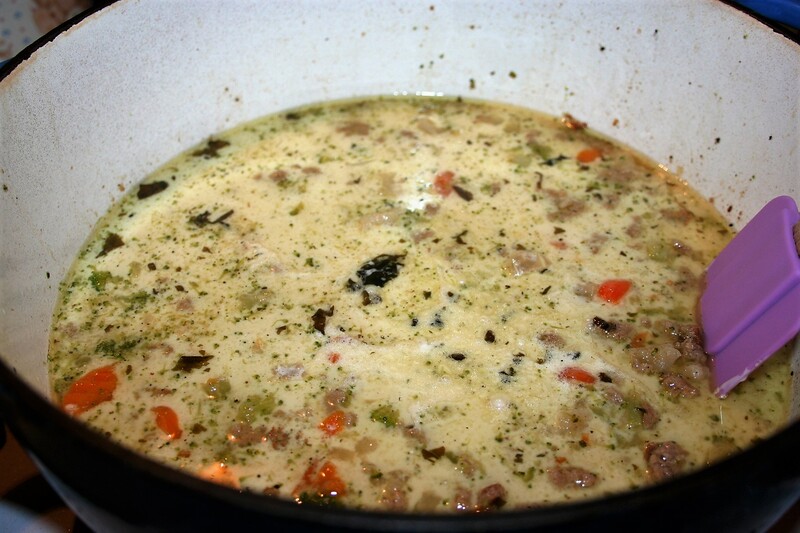 Add the cream cheese and milk, stirring until it is thick, scraping any brown bits from the cooked meat into the creamy sauce. 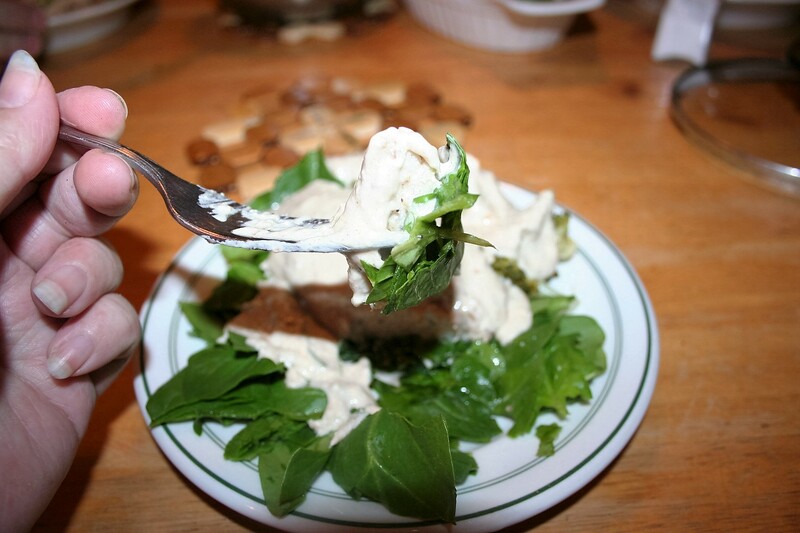 Serve on a bed of raw spinach. 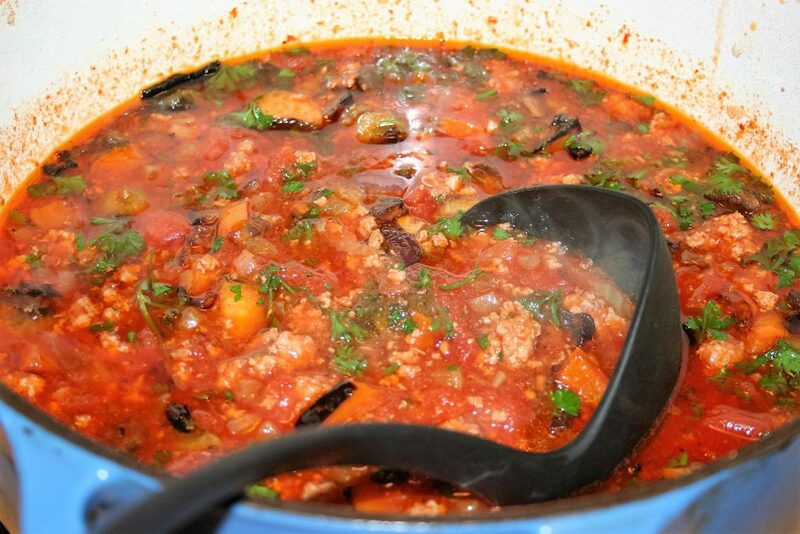 The meat and sauce will perfectly wilt the spinach. When I serve broccoli with this meal, I double the sauce because we like to add it to the broccoli. 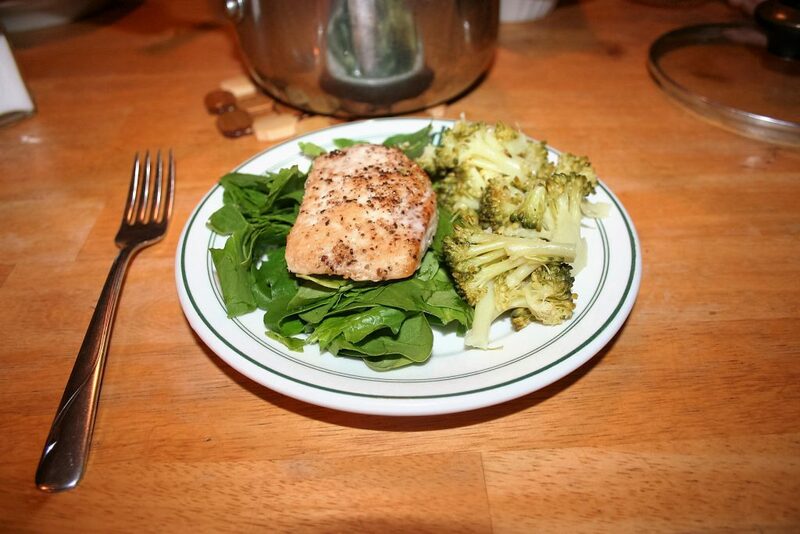 In order for the spinach to wilt properly, it has to be under the hot food, chicken and/or sauce. 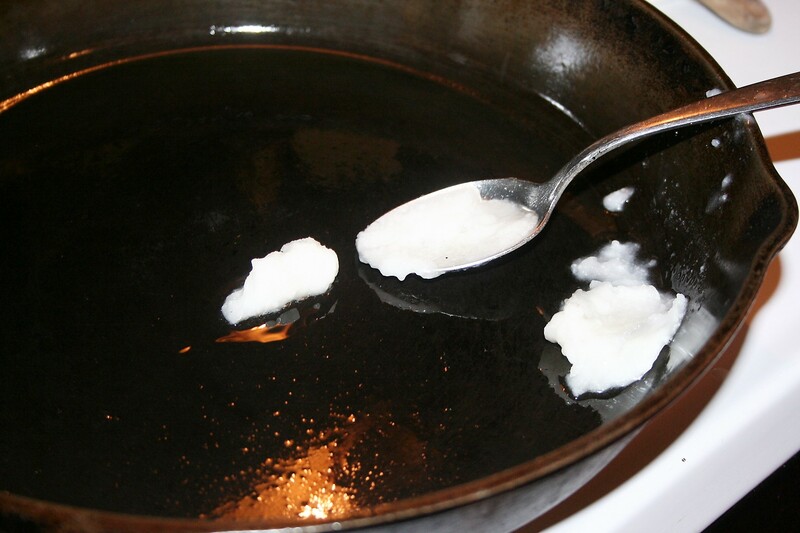 In a skillet, heat oil (or substitute butter) over medium high heat. 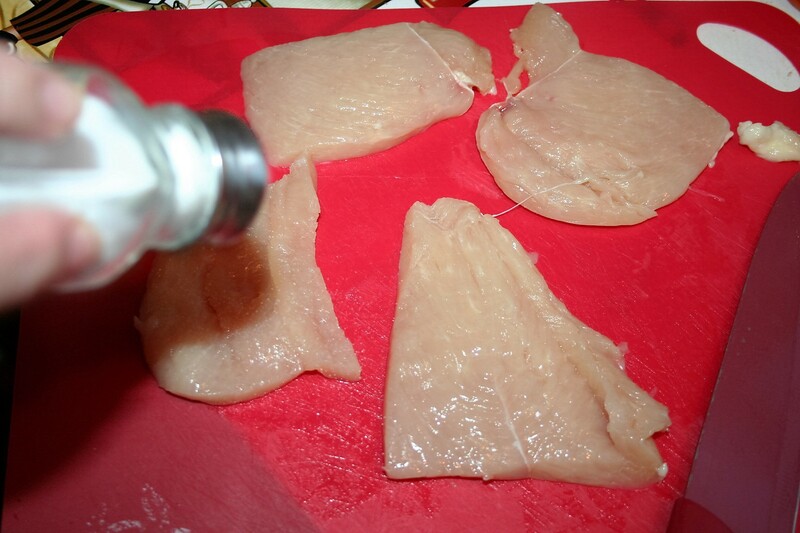 If using chicken breast, cut it into four cutlets. 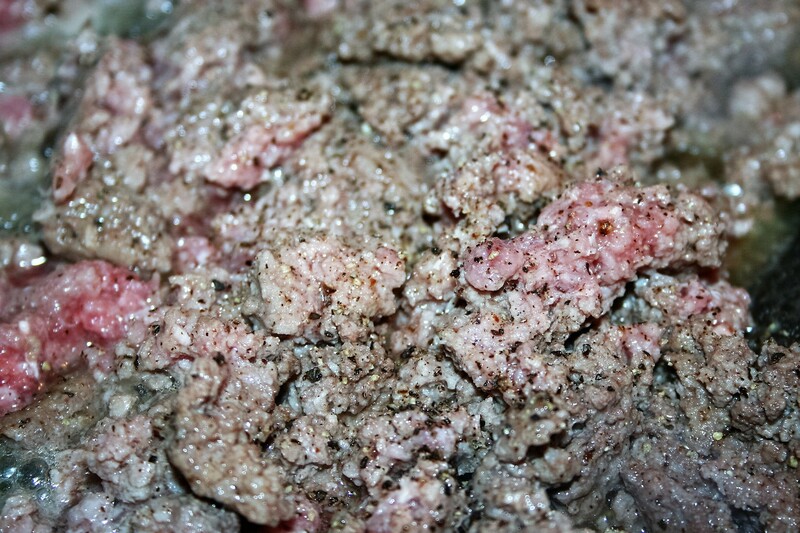 Brown the meat on both sides. Add garlic and sauté for a minute or so, careful not to let it burn. 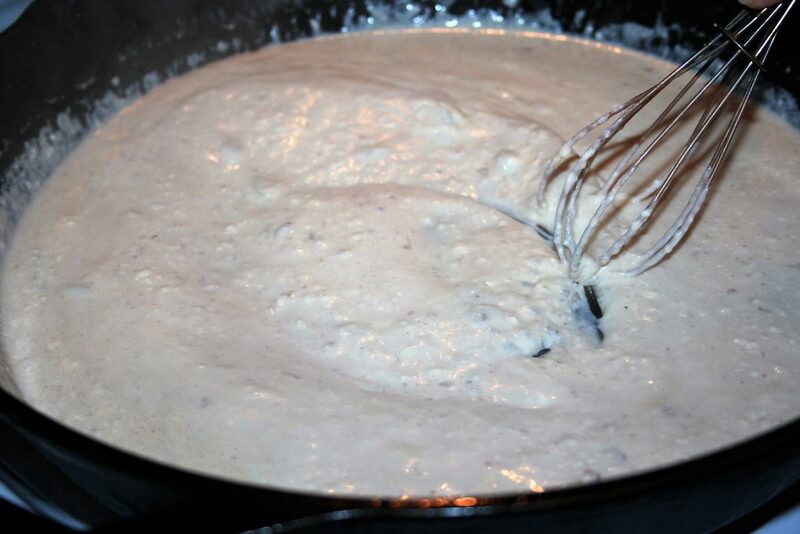 Add cream cheese and milk.stirring until thick, incorporating the browned bits from the bottom of the pan, left from cooking the meat.